The final part of our South African trip took us back towards Cape Town along the N2 through George, Mosselbaai and Swellandam where we stopped for a light lunch and to stretch our legs. 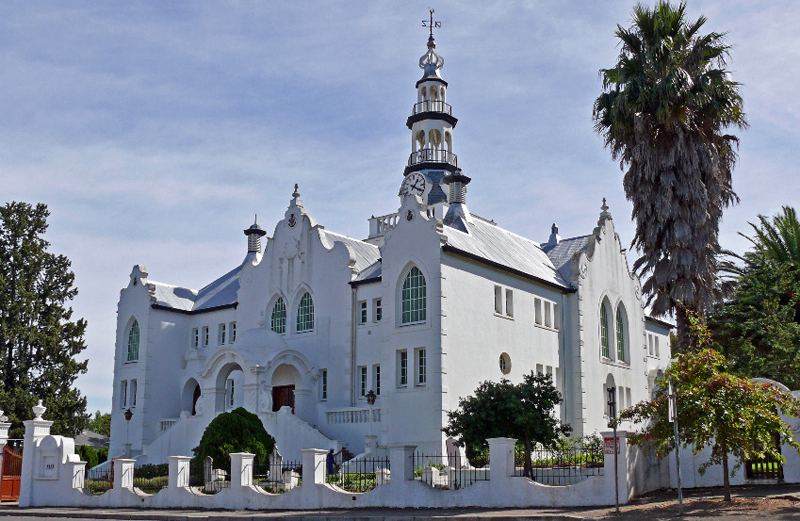 There is a lovely Dutch Reformed Church and an interesting museum so Swellandam would make a good place to stopover en route to the Garden Route. After Botsrivier we turned off onto the R321 towards Villiersdorp, a winding road with beautiful views across the Helderberg (formerly known as Hottentots Holland) Nature Reserve and around the Theeswaterkloof Dam. Here we turned onto the R45 up through the Franschhoek Pass and stopping for an awe-inspiring view from the top of the Cat’s Road which is a series of hairpin bends winding itself down to the Franschhoek Village like a sleeping serpent. As you drive over the pass on the R45 from Theewaterskloof Dam, you have no idea of that beautiful valley ahead of you. Franschhoek has always been a huge favourite of mine. Back in the 1970s it already had a reputation for award-winning restaurants and wine estates, top class boutique hotels, auberges, and guest houses (many located on working vineyards) and speciality shops. Then however, I didn’t have the means to take advantage of what it had to offer, but the surrounding landscapes have always been free. 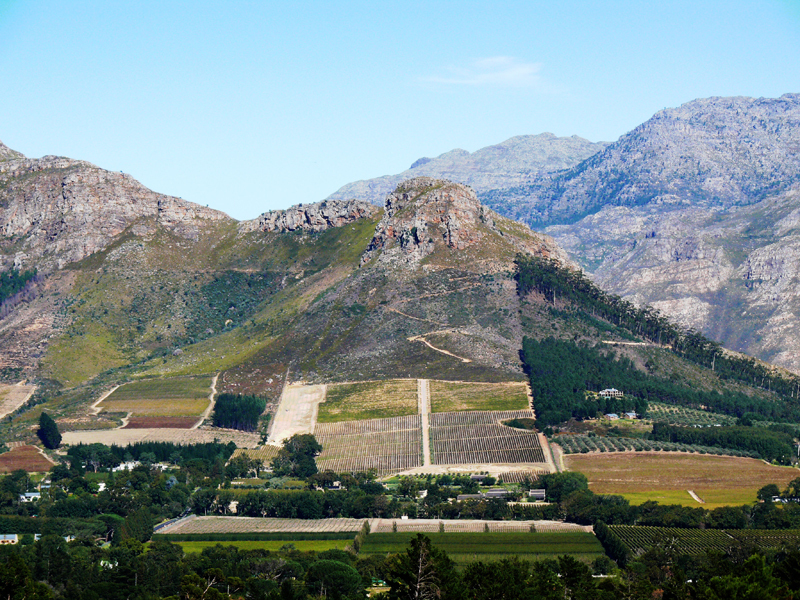 This magnificent valley with its huge towering mountains on either side with spectacular vineyards that clad the mountain slopes has the most breath-taking scenery in the Western Cape (if not the whole of South Africa). 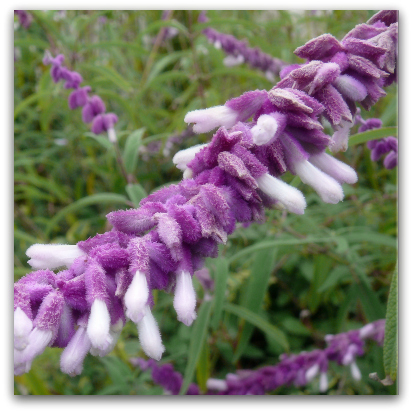 The valley was settled more than 300 years ago by the Huguenots, who brought with them their French culture and wine growing skills when they fled their homeland after Protestantism was outlawed. 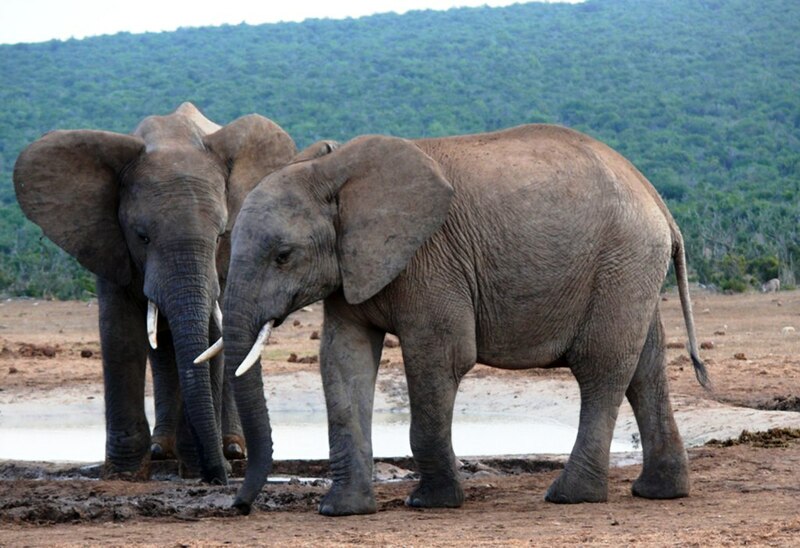 Some arrived at the Cape of Good Hope and were given land by the Dutch government in a valley called Oliphantshoek (Elephant’s Corner) so named because of the vast herds of elephants that roamed the valley. 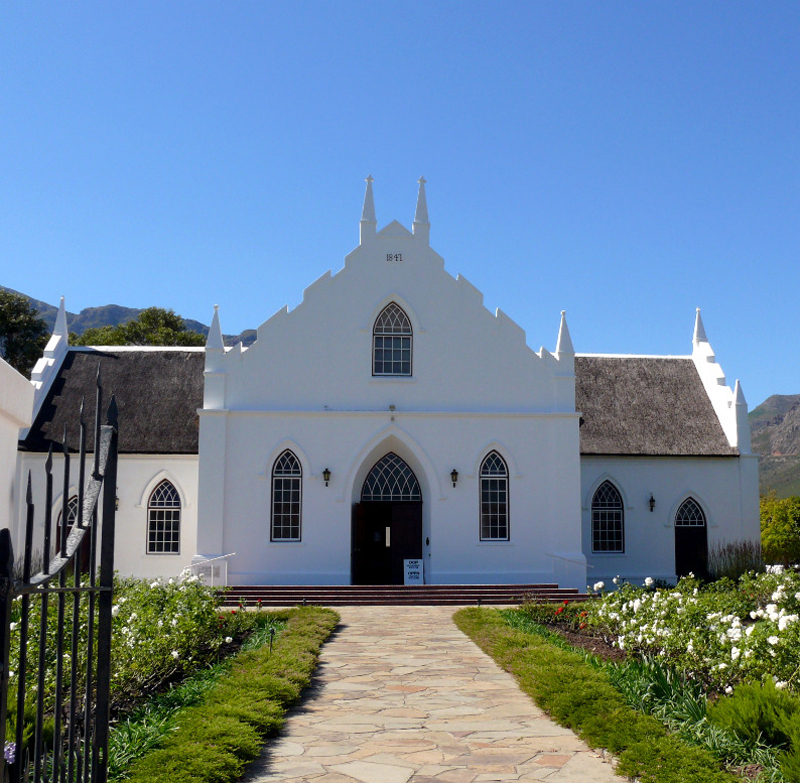 Soon after the Huguenots settled here it became known as Franschhoek (French Corner). As you drive into the village from the south you will notice the Huguenot monument, and close by the museum, which chronicles the history of those brave pioneers and the original Huguenot farms. 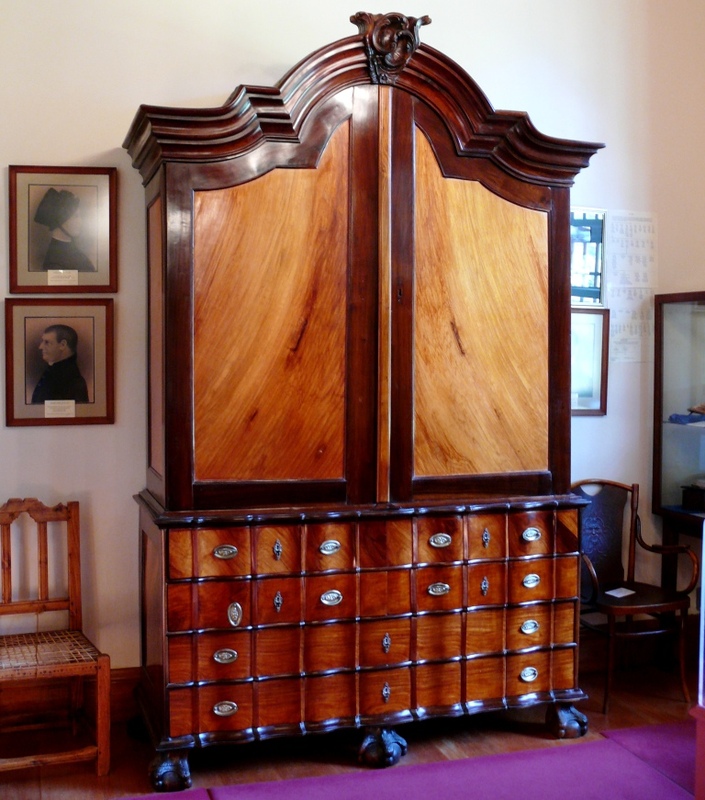 It is well worth visiting the museum to get an understanding of the history of the region. 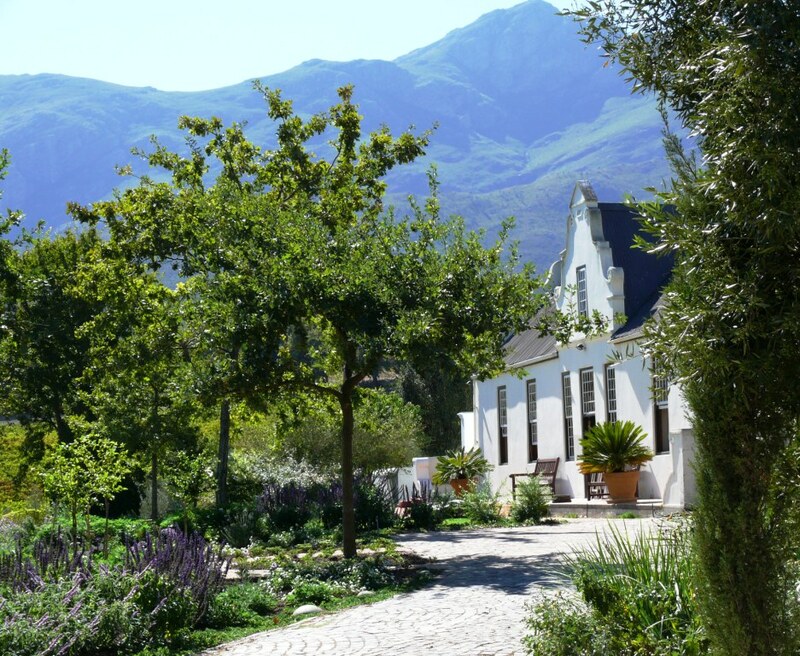 You will also notice that many of the farms still bear French names and are often resplendent with a spectacular Cape Dutch homestead, towering oak trees and vast vineyards. We stayed at Auberge la Dauphine (Klein Daupine), on the outskirts of the village. 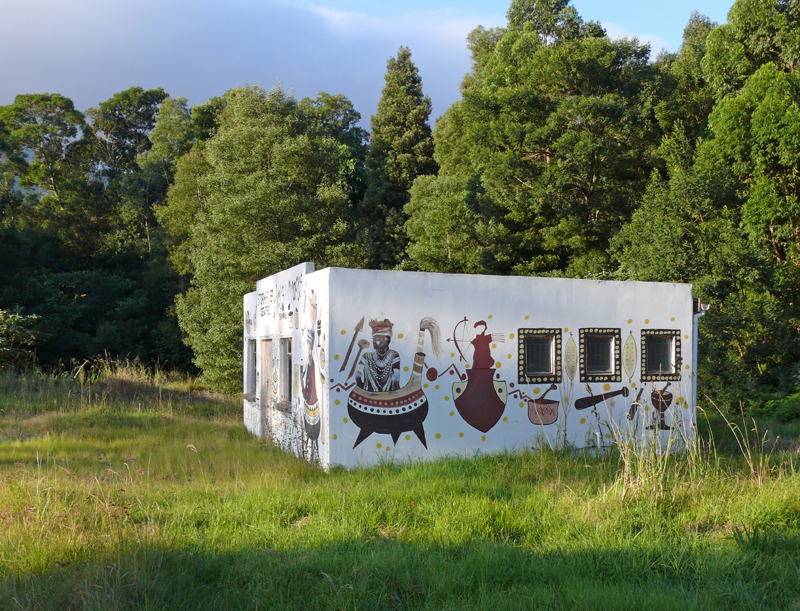 A beautiful spot, ringed by the Hottentots Holland Mountains, and with its own dam and summerhouse where you can sit with a bottle of inexpensive sparkling wine and watch the sun go down turning the tops of the mountains pink and the sky ink blue. On our first night we ate at “French Connection” having West Coast mussels, crispy duck with raspberry sauce, potatoes dauphinoise and stir fried vegetables (cut beans, carrots, courgette and mange tout), washed down with a superb bottle of Shiraz from one of the nearby cellars – Porcupine Ridge. The following day we went back up the hill to Haute Carbière for their cellar tour and wine tasting which was pretty good and very cheap (R30) to taste five wines. 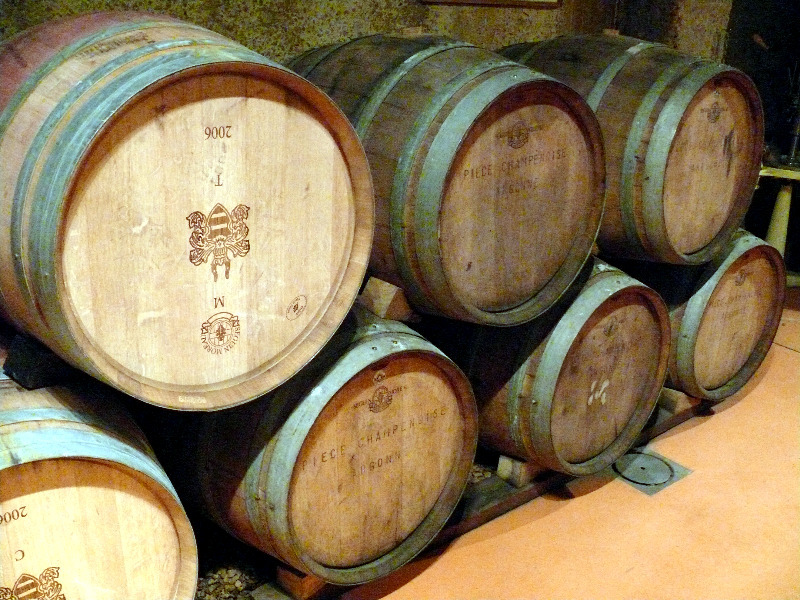 Carbière belonged originally to a French Huguenot farmer, Pierre Jourdan who was given the land in 1694. In 1982 the vineyards were replanted in the tradition of the Champagne, and focus on Pinot Noirs and Chardonnay cultivars. We bought a bottle of the sparkling, champagne-like ‘Blanc de Blancs’ (R98) to put into our fridge and booked a table in their gourmet restaurant for that night before heading back into the village to have a good wander around. A host of shops and galleries line Main Street with antiques, artwork, bookshops and bric-a-brac. There are several specialist shops including a chocolatier, where we bought some hand-made Belgian style chocolates (R26), and a fromagerie. Don’t restrict your wandering to the main Street though as it is rather pleasant to walk along the streets behind where you can see some lovely Cape Dutch and Victorian architecture. After a light lunch (salad) in the village we returned to the auberge to rest. Dinner at Carbière was, frankly, out of this world. All their items on the menu are available in half or full portions so you can have as many different dishes as you like. They also do tasting menus, pairing wines with each course. We had the Cuvée Belle Rose (100% Pinot Noir fruit portraying elegant sophistication) with our starters of prawn rolls with chilli jam and herb salad / pea, leek and asparagus tart with herb salad – the pastry was so light it practically melted in your mouth; for mains we both had the chicken stuffed with a layer of lentils and served on a bed of tagliatelle, spinach, spiced cubes of butternut squash and very firm asparagus tips with rocket and chorizo jus which was accompanied with a Brut Sauvage (yeasty with a creamy finish, wild and elegant mystique); dessert was a meringue with raspberries, raspberry coulis and strawberry yoghurt ice-cream (all delicious) and my husband had a most unusual looking desert consisting of 3 tiny sweet spring rolls stuffed with hot dark chocolate and served with a shot-glass of a white chocolate milkshake – exquisite – and this came with a glass of the sparkling Blanc de Blancs. The whole lot came to R550 (around £40 at the time) plus a R5 tip for the car guard. 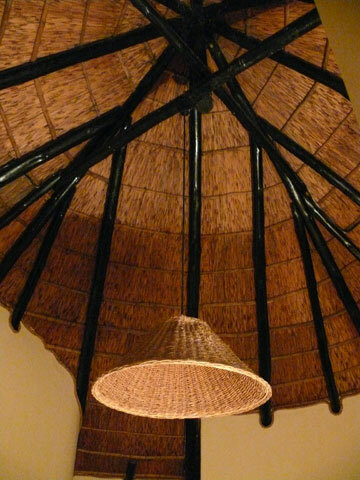 Currently there are lots of menu options, including wine pairing, from R295 per person . 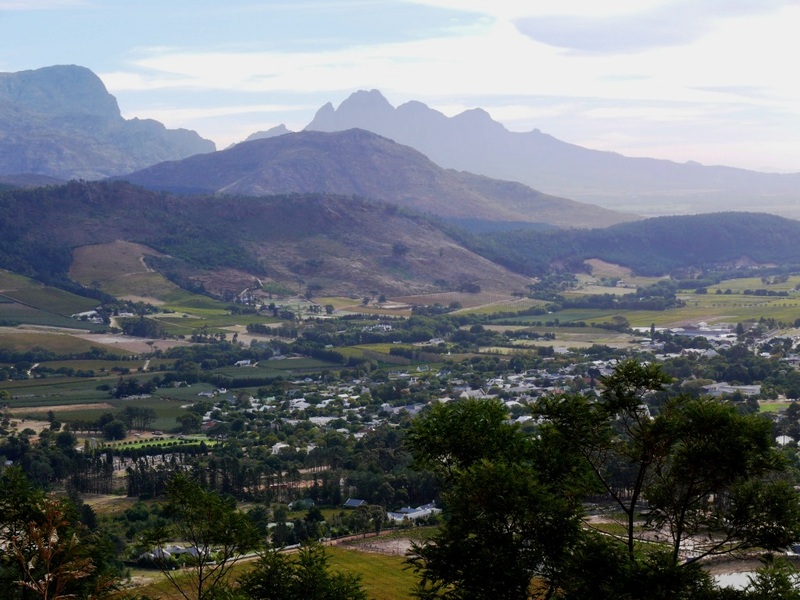 On our last day in the valley we decided to have a look at a few other vineyards in the area such as Grande Provence, Boschendal, and Glenwood and then drive over the mountains to look around the university town of Stellenbosch. Grande Provence is lovely and has a fabulous setting for their restaurant, Glenwood is in the little valley of Robertsvlei and surrounded by outstanding natural beauty. Stellenbosch however, defeated us as we could not find anywhere to park! 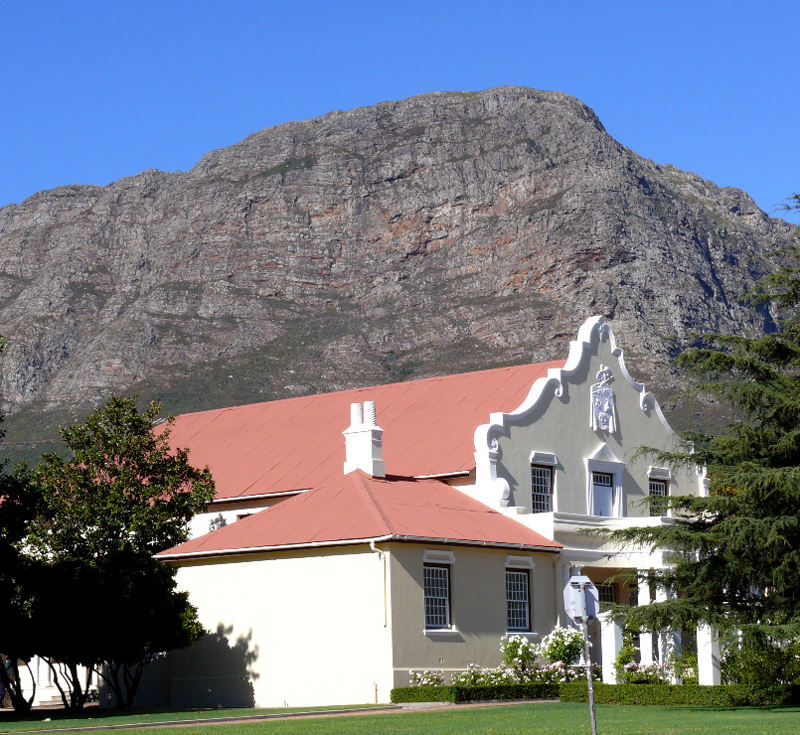 We drove around for a while but the centre was absolutely packed so we had a look at it from the car, admire the beautiful Cape Dutch-style homesteads, the university and the tree-lined streets. 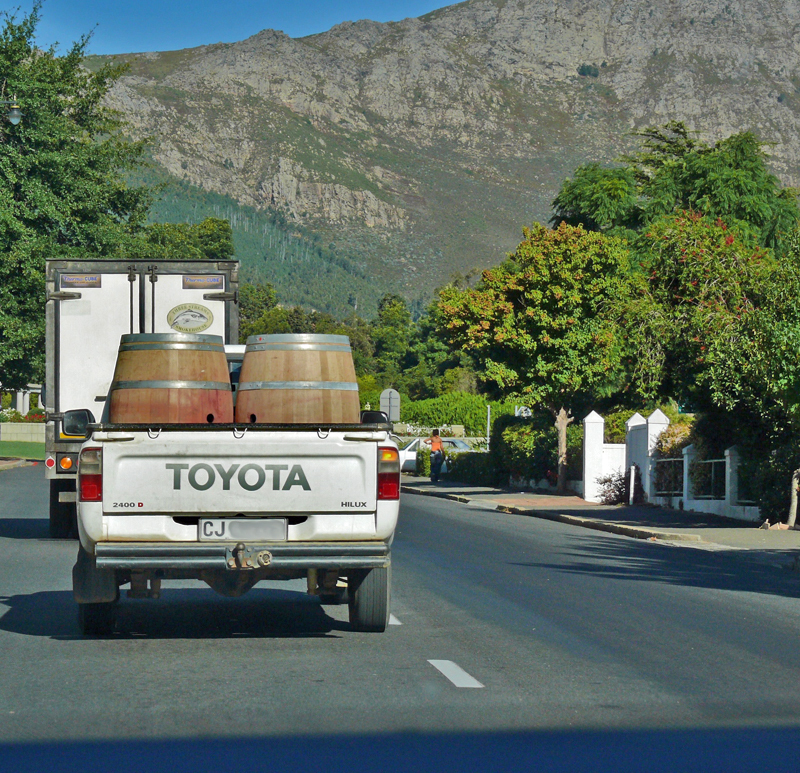 On the drive over to Franschhoek from Stellenbosch on the R310 – Helshoogte Road look out for Tokara Winery which is famous as an olive oil producer and located right at the top of Helshoogte Pass. Passing a village called Languedoc you come to Boschendal one of the most famous wineries with exceptional grounds. 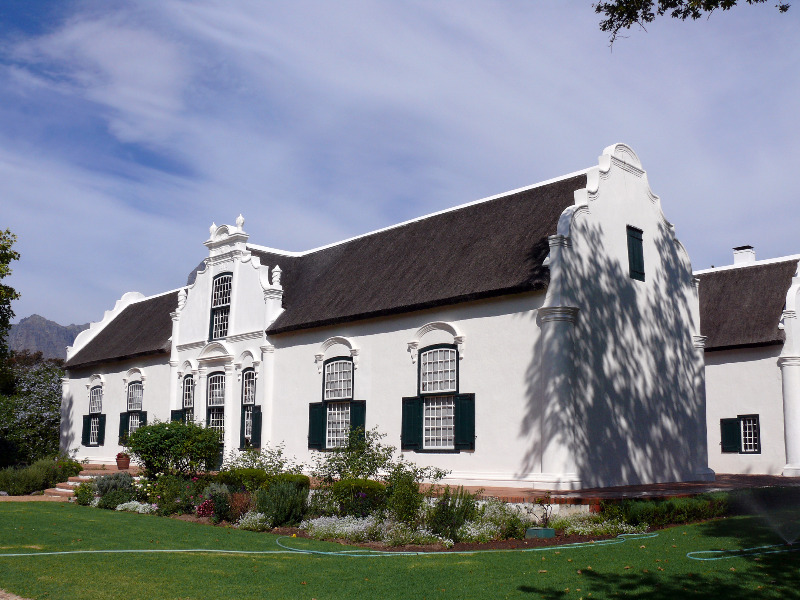 The farm Boschendal means “wood and dale” and was granted to Jean de Long in 1685. A fellow Huguenot, Abraham de Villiers bought it in 1715 and was responsible for the buildings you can see today. Boschendal is famous for its “picque-nique” (mid Oct to April only) which you can buy in a basket and then eat in their gorgeous grounds. You can visit the delightful manor house with yellow wood ceilings, floorboards and doors set in teak frames and stroll around the delightful gardens, including a very fragrant herb garden. Naturally, food was not far from our minds and we bought a glass of real lemonade and a chocolate and coffee ice-cream sundae from the Café (formerly slave quarters), sitting under the shade of the lovely oaks in the grounds and watching the white ducks (pure Jemima Puddleducks) strutting around looking for titbits. Our final dinner in South Africa was at the “French Connection” again. We had the mussels as a starter (from Walvis Bay) followed by sole and couscous with butternut squash, feta cheese, courgette and a pesto sauce. Finished off with a Dom Pedro Kahlua, double espresso and an amaretto. Sublime! 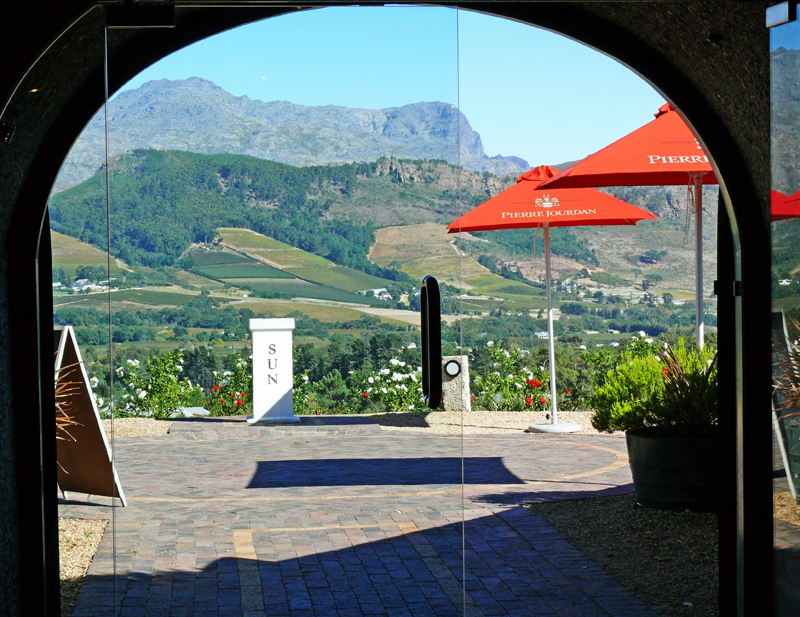 Need a reason to visit Franschhoek? Believe me when I say it is one of the most beautiful wine valleys in the world. And the food and wine ain’t half bad either. 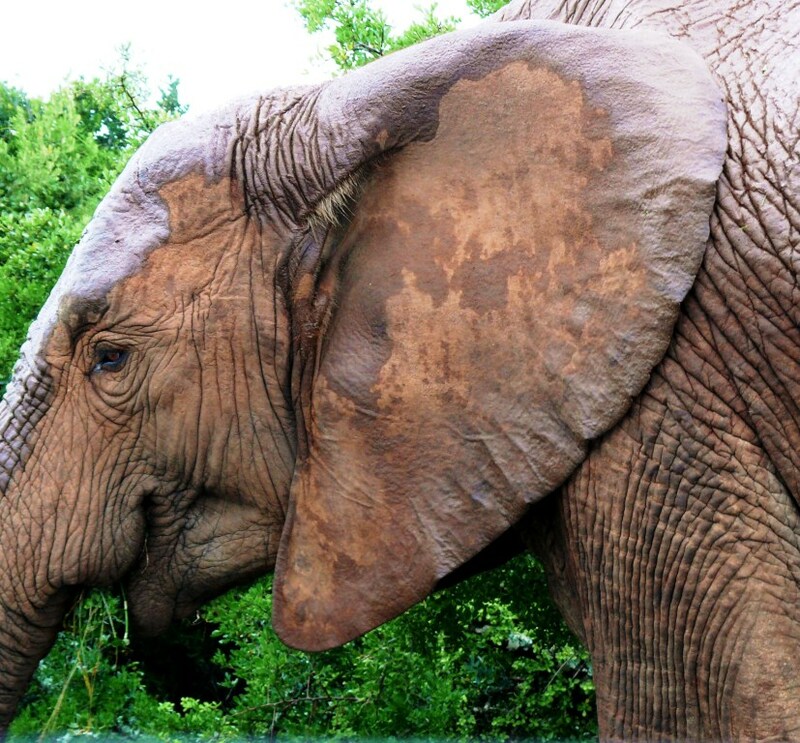 After Addo we retraced our steps along the Garden Route towards Cape Town deciding to stop over at another place I have always wanted to visit, primarily because I love the name Tsitsikamma National Park. 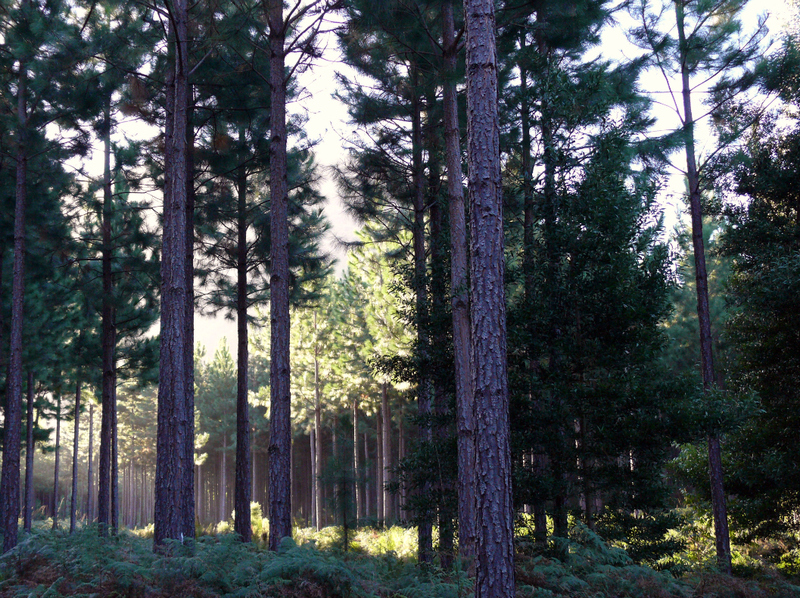 Tsitsikamma is a khoi word meaning “place of abundant or sparkling water” and the beautiful indigenous forest protected by the State, is home to centuries old trees such as Yellowwood, Stinkwood, Hard Pear, Ironwood, Kamassi and many others. Of course those ofyou who are extreme sports fanatics (you know who you are) will no doubt of heard of this region as it is famous for the world’s highest bridge bungee jump from the dizzying Bloukrans Bridge on the old road, zip-lining through the canopy of the trees or going down the Storm’s River itself on a rubber tube! 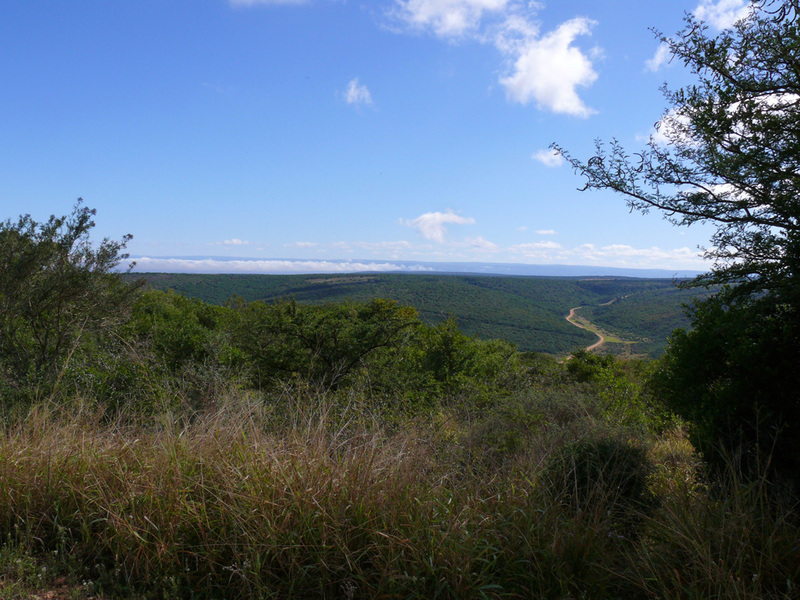 It is well-known for the Otter trail a spectacular trail between Nature’s Valley and the Storm River and many other hiking trails in the Tsitsikamma Mountains amongst mountain fynbos and indigenous forests with wonderful river gorge and mountain scenery. There are plenty of rivers, streams and rock pools for swimming and swinging rope suspension bridges slung near the waters for walkers. After leaving Addo by the Colchester exit we joined the N2 and drove east past the Sundays River. The San people originally named this river Nukakamma (Grassy Water) because the river’s banks are always green and grassy despite the arid terrain that it runs through. 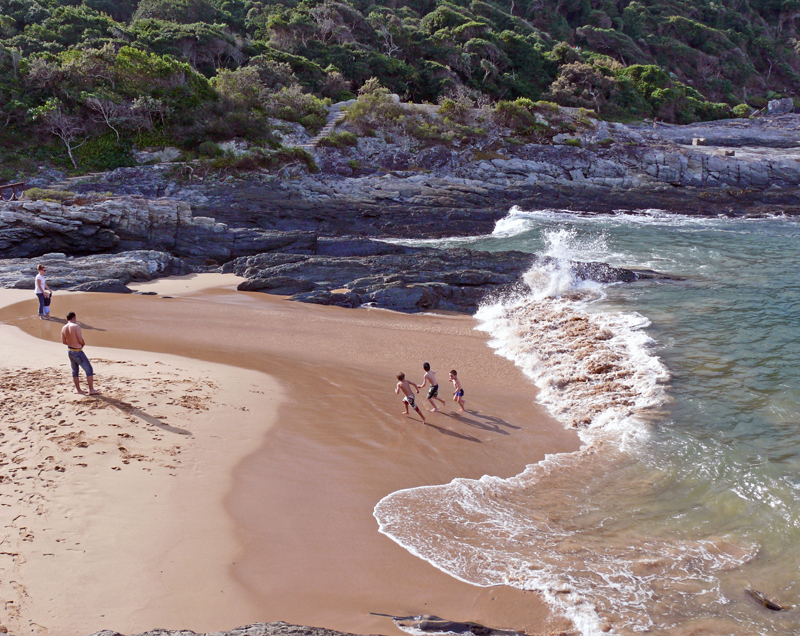 It looked a very pleasant spot to visit, but I wanted to pop into Jeffrey’s Bay – a long time favourite surf spot in the 1970s. 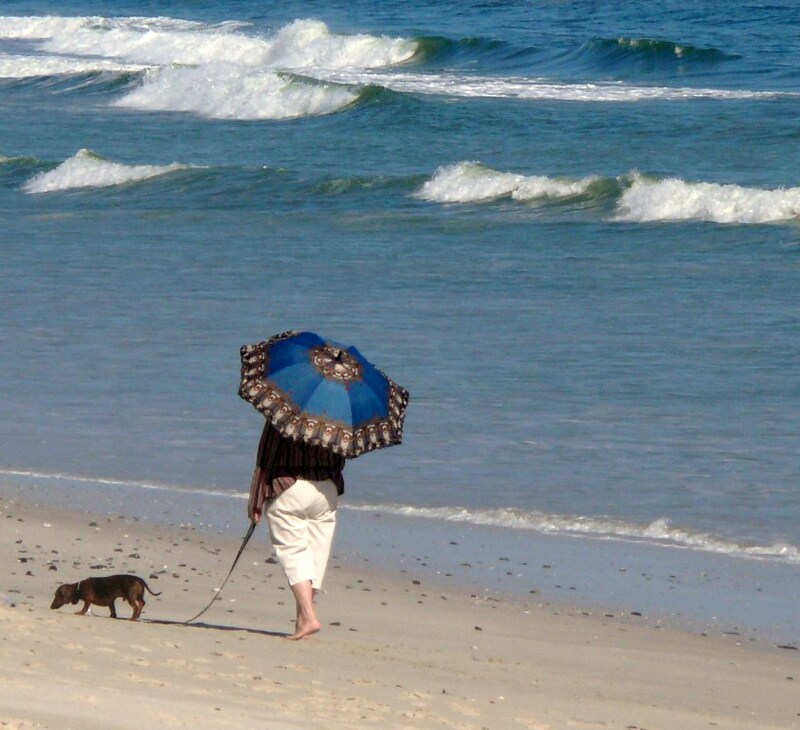 On entering Jeffrey’s Bay from Port Elizabeth you drive along the Kabeljous Estuary and Nature Reserve which is a walk-about reserve and has a safe swimming beach. 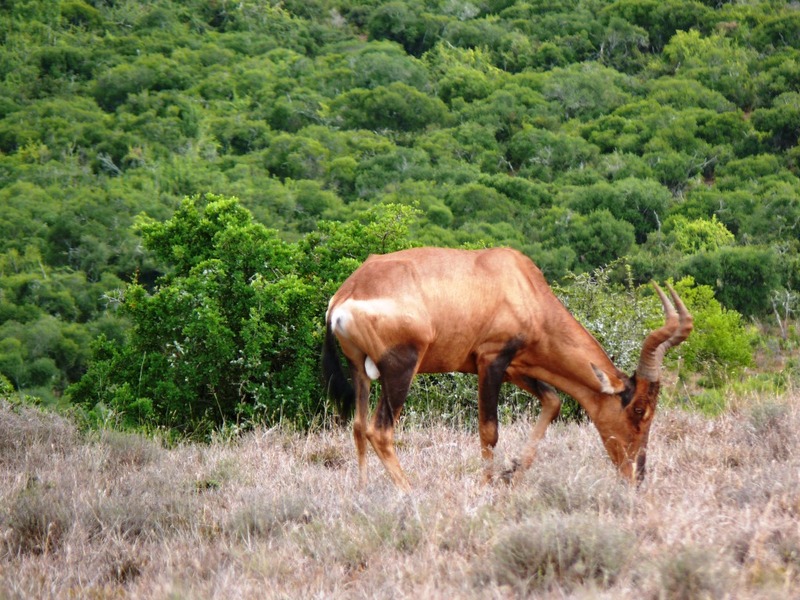 It is an excellent fishing and bird-watching area so it’s probably worth staying near ‘J Bay’ for this alone. 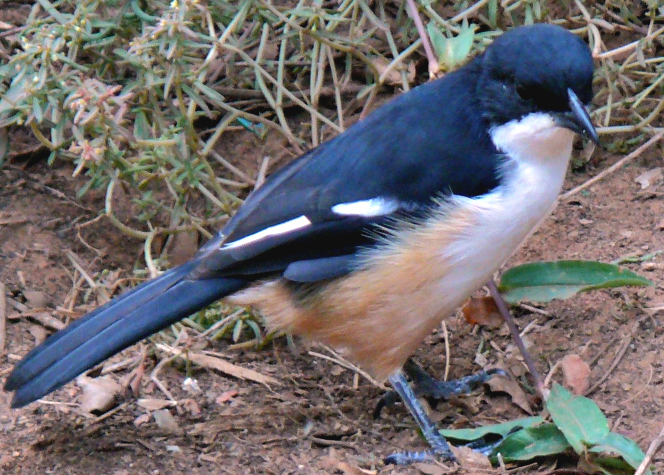 The Noorsekloof Nature Reserve (near the golf course) has a 3km trail running alongside a stream from which you can see many species of bird and some small buck and if it is bird-watching you are after then the Seekoei River Estuary, as you enter the main town, is the place to go. 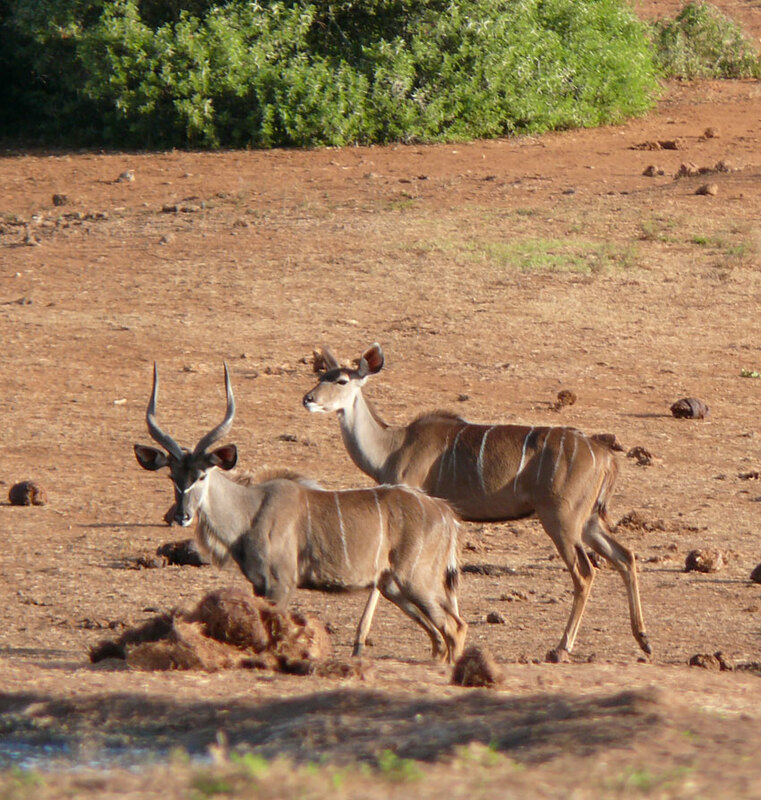 There is an abundance of water fowl and a hide overlooking the river. “J-Bay” as it is known to the locals, brings to mind surfing, sunshine and beautiful beaches – and you’d be right. 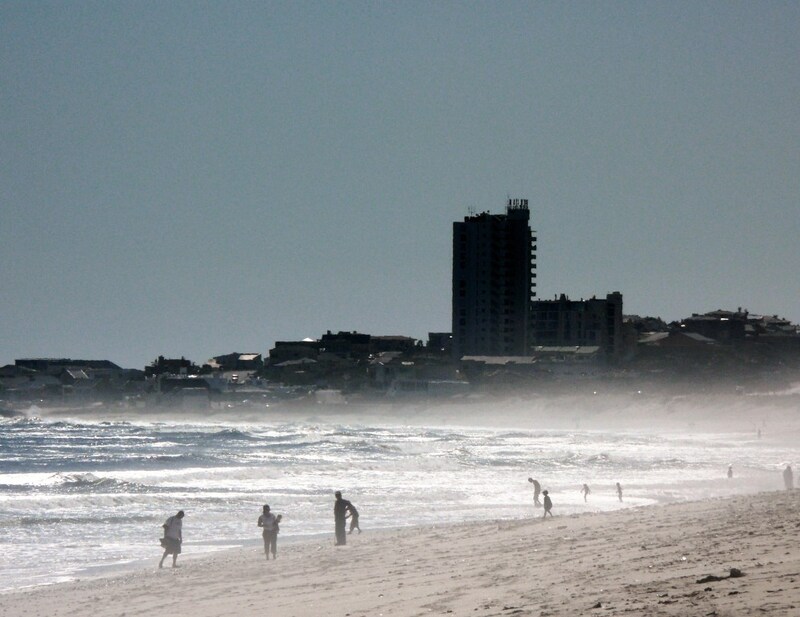 Home to the Billabong Surfing Festival every July and rated among the ten best surfing spots in the world, surfers from across the globe come to enjoy the rolling breakers. As often happens I was disappointed with what I found there. 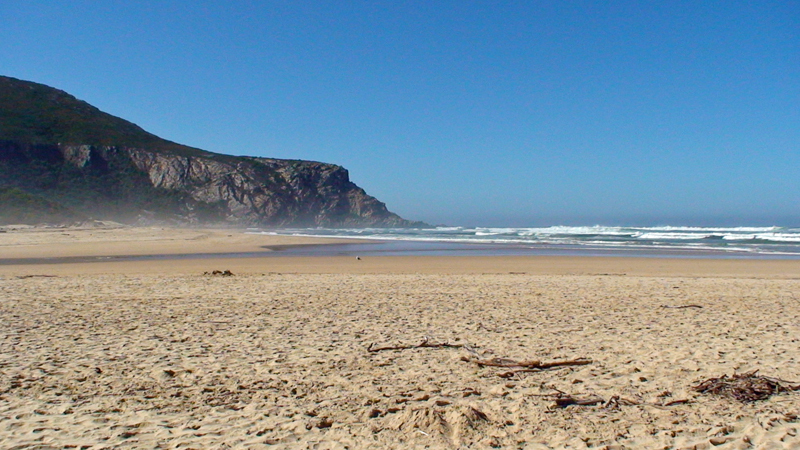 It does have a lovely long and sandy beach, though at the time of our visit a distinct lack of surf, and therefore a deficit of surfers. There is apparently a Surf Museum and a Shell Museum which unfortunately we didn’t know about at the time as they would have been intriguing to visit. All I saw was a depressingly long Main Street lined with identical shopping malls and boring holiday resorts. 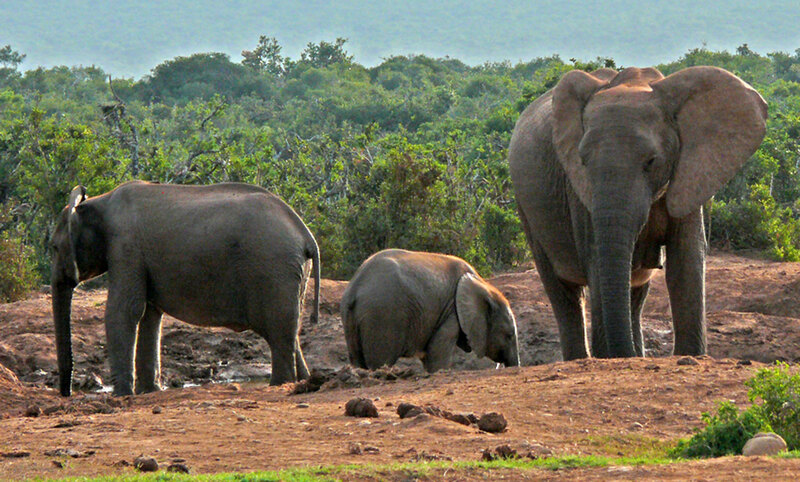 On reflection after the open wilderness of Addo all these signs of humanity were a little bit too overwhelming at the time. 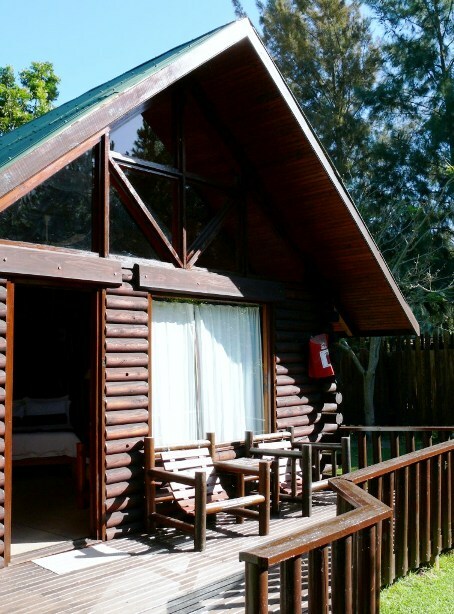 Tsitsikamma We continued onto the R102 to Humansdorp before re-joining the N2 and making our way to the Tsitsikamma Lodge where we had booked a delightful log garden cabin complete with spa bath! Slightly more luxurious than the rondavel in Addo. It felt good to be sitting outside on the private deck having a couple of Castle lagers and updating my travel journal before heading off for a stroll in the beautiful surrounding forest. Dinner at 7 p.m. that night was in the lodge restaurant – a set menu – broccoli soup followed by fish and salad, roast leg of lamb and seasonal vegetables, desserts and cheese and biscuits. We didn’t quite make it to the end and were in fact in bed by 9 p.m. The following day we headed out to Nature’s Valley, the plan being to make our way back to the lodge from there stopping at various sites. Unfortunately we had to go along the N2 and therefore through the toll plaza between The Crags and Storm River as there was no alternative route due to the R102 being blocked by the flooding in December (remember the tjoe-tjoe?). Chris from the lodge said that the problem was that local government was waiting for the national government to declare it a disaster area so that they will pay for it. Meanwhile until someone decides who has to pay for the repairs nothing is done! 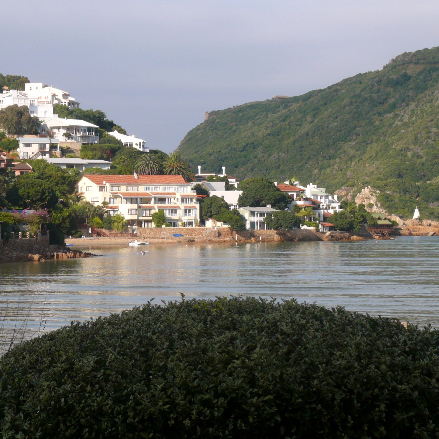 Nature’s Valley is incredible – far nicer than Jeffrey’s Bay – in my opinion. 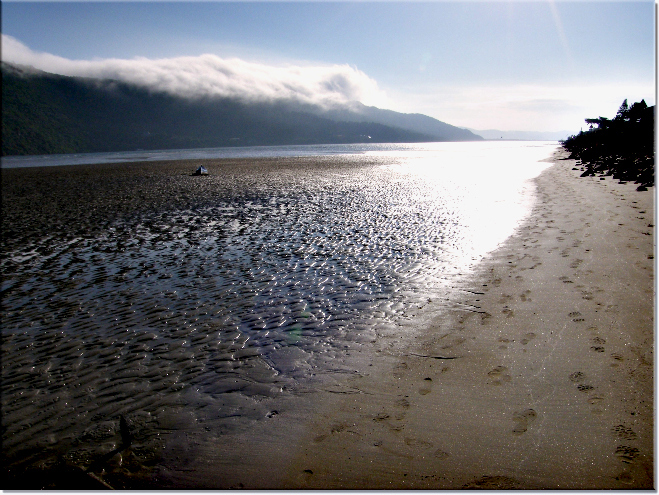 Wide, white sands, a safe lagoon for swimming and all in peaceful, natural surroundings. 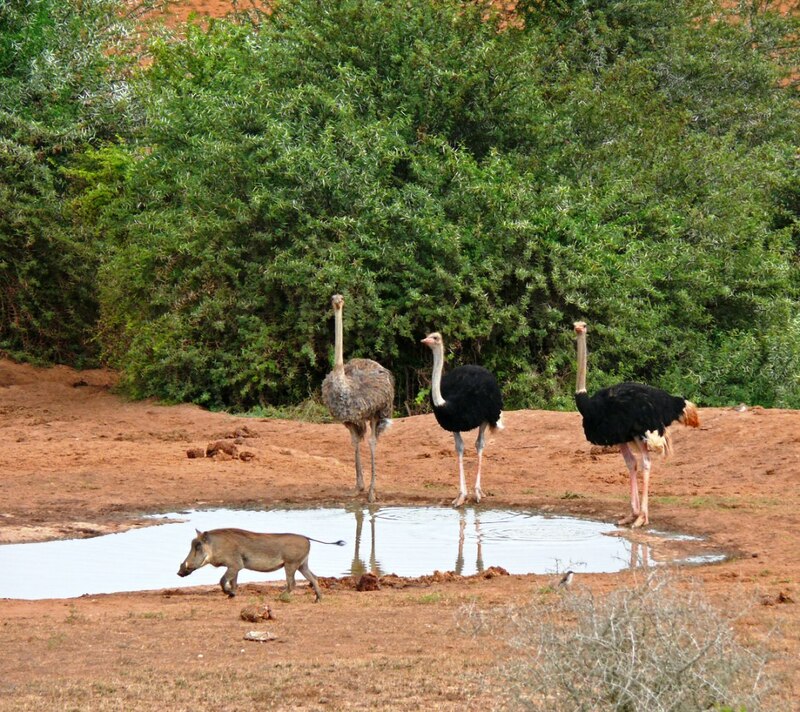 No shopping malls and no garish developments, just a small community with one pub/shop/restaurant at the far end and some local pink-bottomed baboons! 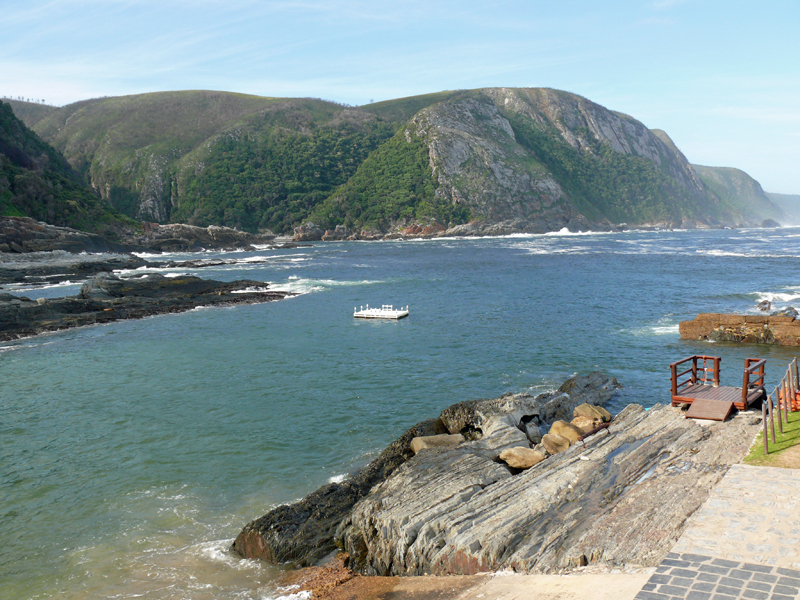 This is one end of the otter trail which is considered to be one of the best trails in the world. It is not an easy trail; it is 42.5 km long and takes five days to complete. It follows the rugged coastline and cliffs returning to the shore line to cross rivers. Many years ago my sister-in-law did the trail and considered it one of the best things she ever did in her life. Sadly I have not done it and probably never will now given the steep descents, difficult river crossings and dangerous rock scrambles. We ventured a little way along the Salt River Walk which starts from the shop at Nature’s Valley and is around 9 km long. 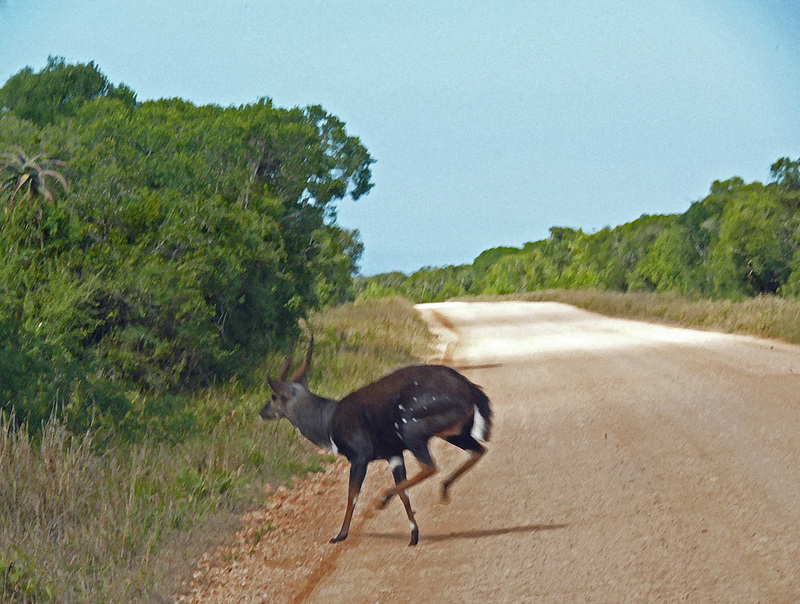 It takes a circular route along the beach and into the scrub forest. We followed the route in the opposite direction, along the beach until it wound up into the bush and became too steep to continue. 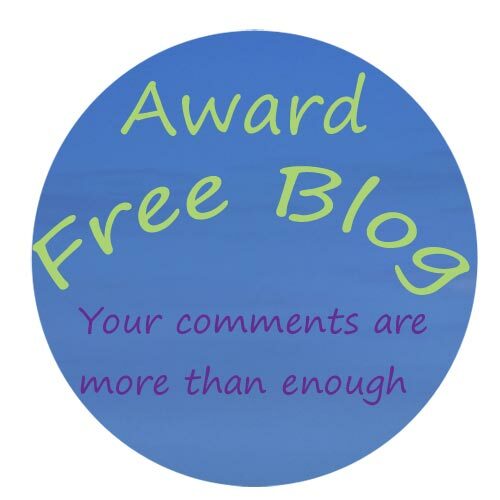 I often get quite annoyed with myself at not being able to do the things I took for granted thirty years ago. Joints too stiff, overweight and under-fit, nervous of slippery slopes and sudden drops are the curses of becoming older and spending too much time working on computers. Storm’s River Mouth On the way back to the lodge we drove down to Storm River’s Mouth. What a spot! 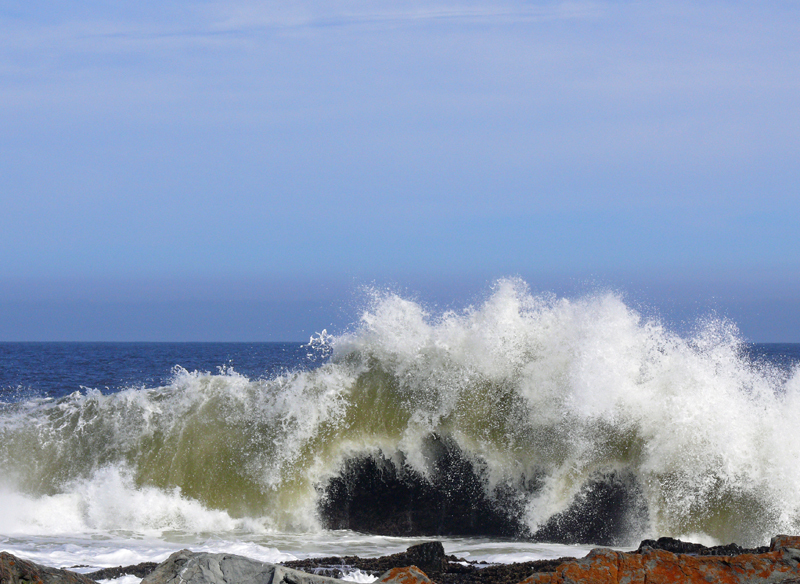 Wild and windy, with huge waves crashing on the rocks, such raw beauty! 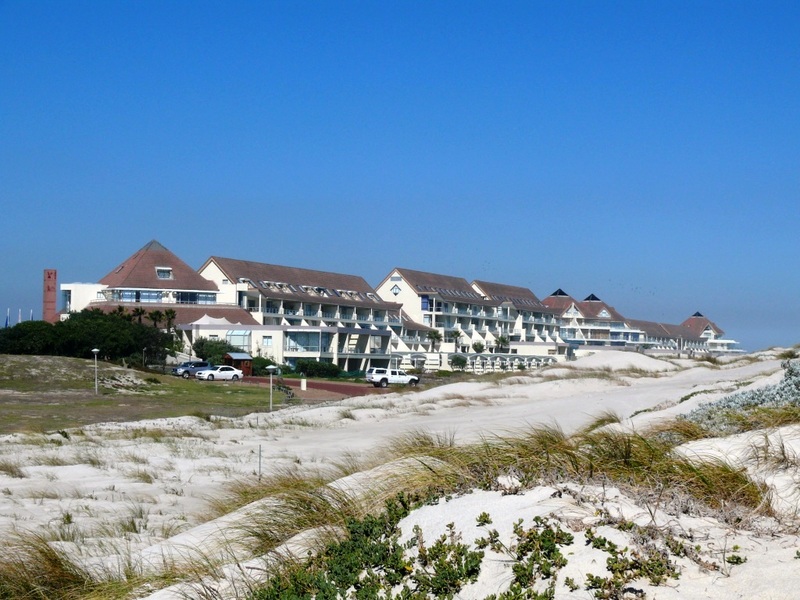 There is a lovely restaurant “Tigers Eye” overlooking the river mouth and small sandy beaches – Mooibaai and Sandbaai and jewel-like sunbirds flittering in the trees. We could have taken a boat into the gorge itself, which looks pretty amazing, but getting on and off the boats looked a little tricky in the considerable swell of the ocean so we decided against it. By the way, the ‘black water‘ colour of the Storm River is caused by tannin leaching out of plant matter; much like tea. We wandered a little way along the Mouth Trail up to Strandloper Cave and along to the rope suspension bridge and lookout point. Unfortunately we couldn’t go onto the bridge itself because the final part of the boardwalk leading to it had been burned in a fire – it was being repaired though so hopefully open again by now. 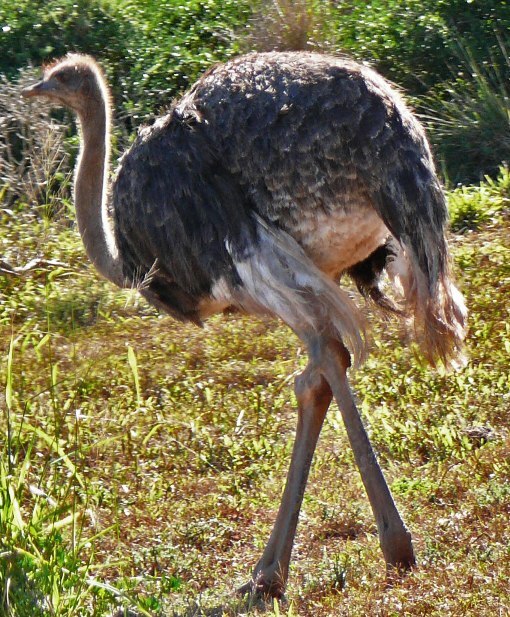 Though working on African time, you never know! Whilst we were exploring a sudden sea fret descended turning everything into one of those eerie sets out of a horror movie – all ghostly shadows and shapes amid the constant boom of the ocean. 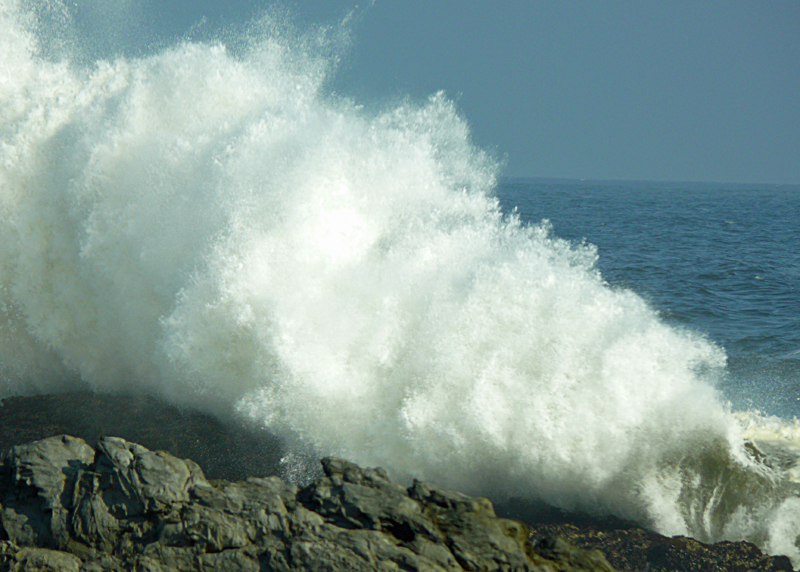 I was mesmerised by the surging waves coming in and breaking on rocks only metres away from the car with such force and incredible energy. 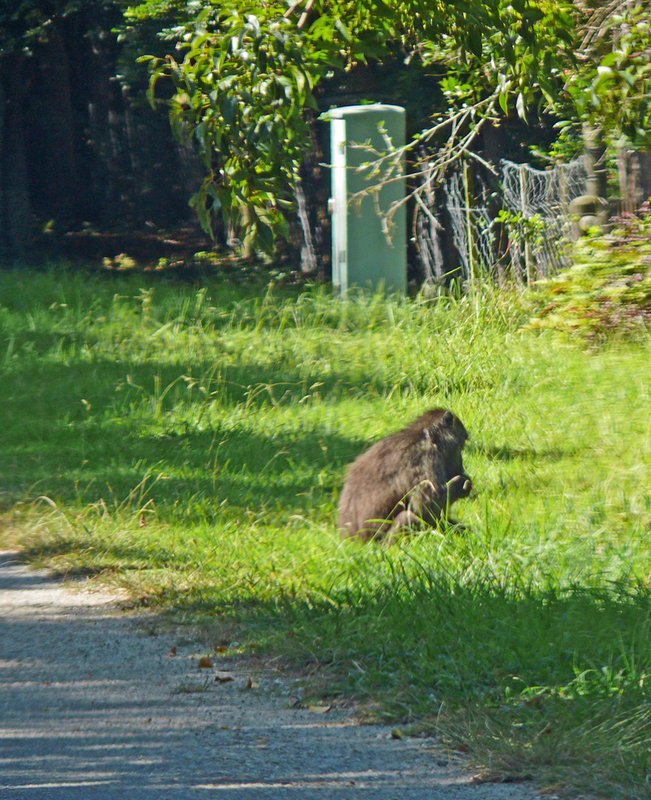 And right next to the shore a group of rock hyrax (dassies) were having their supper. Next time I am in this region I shall book a forest cabin right on this shore. 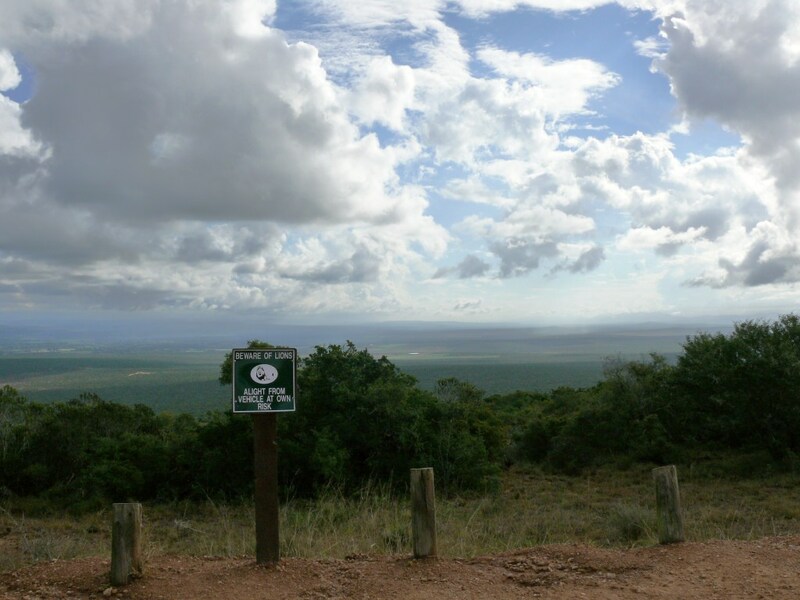 (Book through SanParks). Our final stop was at Storm River Village where you can do a Fern Tree Walk, but we were all walked out by then so instead we opted to retreat to our log cabin for a very large vodka and tonic and a welcome soak in the spa bath! Luxury! 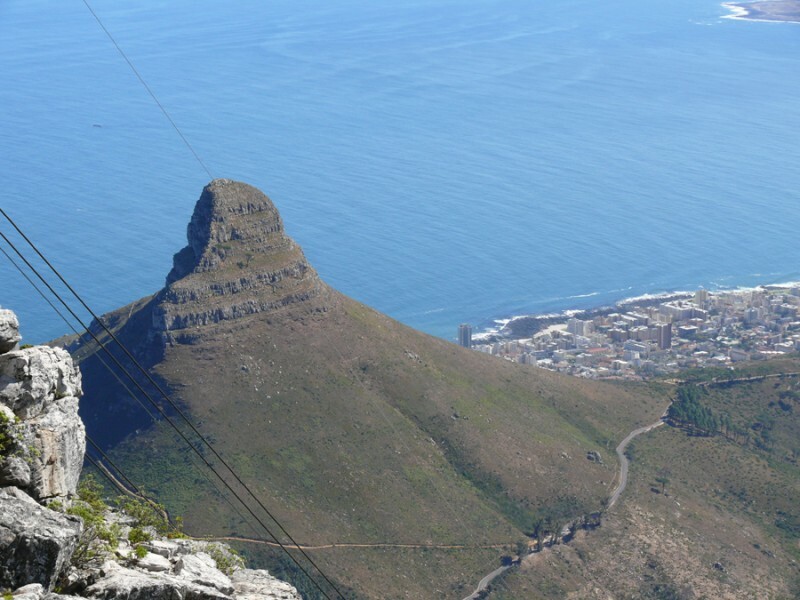 Considering the number of years during which I lived in Cape Town plus numerous visits since, it is surprising that I have only ever been on top of Table Mountain on three previous occasions and then only once was a bright and beautiful day when you could see for miles. The thing you have to remember about this particular mountain is that it often gets covered in cloud (the ‘Tablecloth’) blown in from the Atlantic by a wind known to locals as the ‘Cape Doctor‘, especially in the summer months. 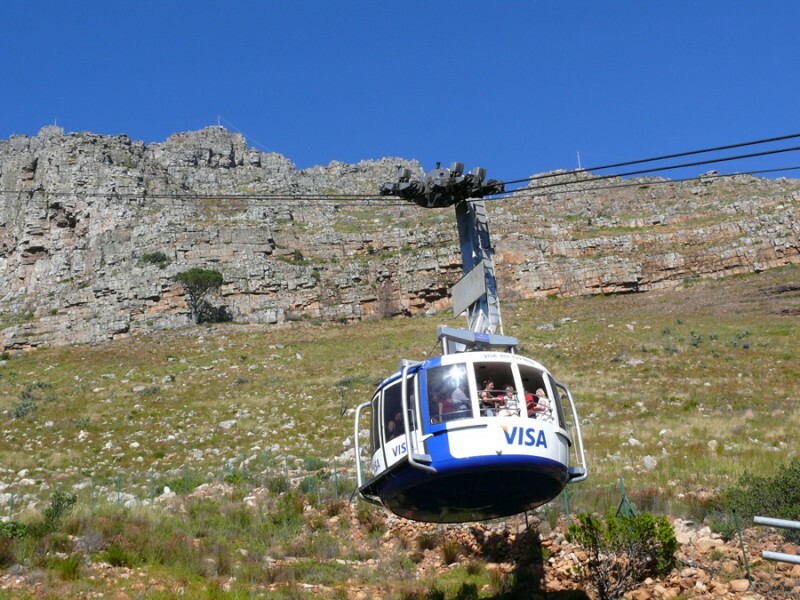 And if it is windy then the cable car does not operate – so don’t rely on it to get you back down. 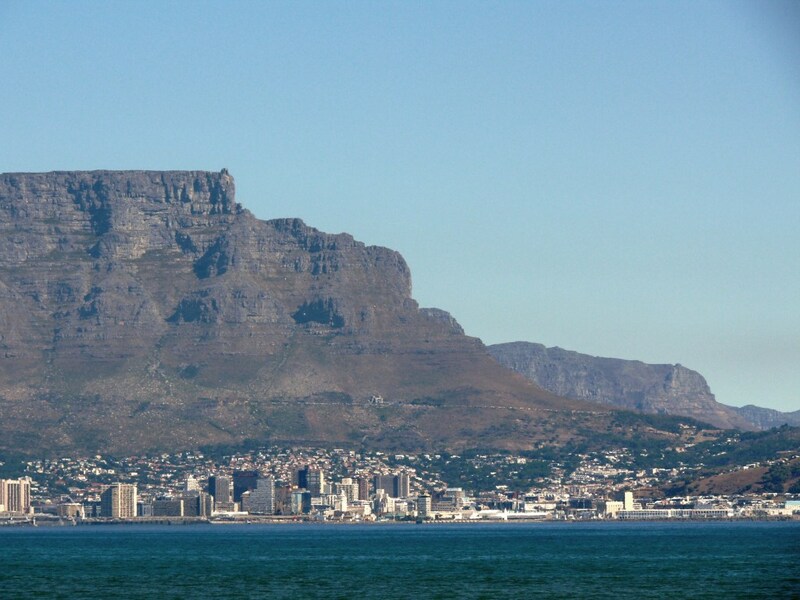 If you intend to visit the Mother City and want to go up the iconic mountain then my advice is that you keep your eye on the weather forecasts and get up there as soon as you can. Don’t wait for tomorrow because tomorrow may be raining or windy and if you do get up then make sure you allow sufficient time to explore as there is a surprisingly large area up there. Many things have changed on the top since the 1980s – but not the 360° views of Cape Town, the ocean and the neighbouring peaks. There is now a large self-serve restaurant and deli and an ice-cream shop and walled, paved courtyards and pathways which makes it a much safer pleasure to walk around taking in the views and there is even a route suitable for wheelchair users. 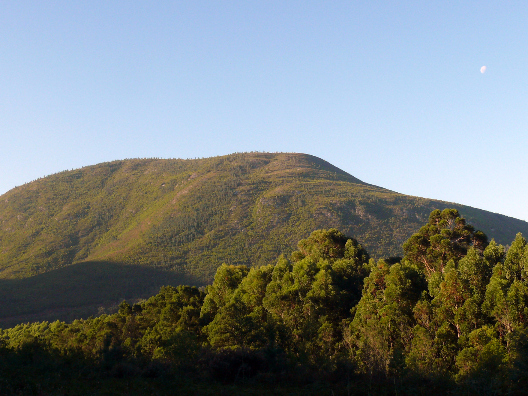 You can of course still wander off on hiking trails and indeed there is the Hoerikwaggo Trail (Hoerikwaggo meaning ‘Mountains of the sea’ in the original Khoekhoe language), a five day trek for serious hikers linking Cape Town to the Cape of Good Hope. As neither my husband nor I are in the flush of youth we took the cable car up and down. 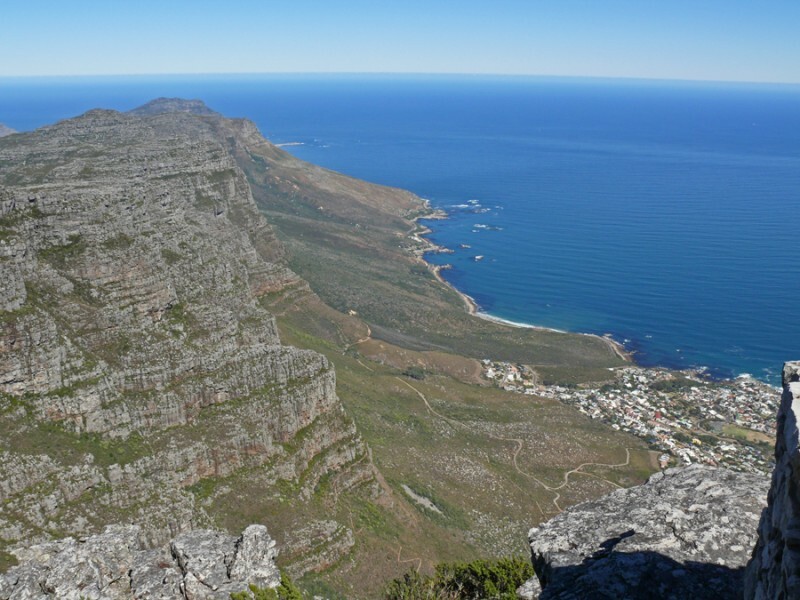 (I once attempted climbing to the top via Skeleton Gorge on my first visit to Cape Town back in 1973, but I was thwarted by the weather closing in suddenly and having to retreat below the clouds. I did come away with a rather splendid spider bite though, so have an everlasting reminder on my forearm.) 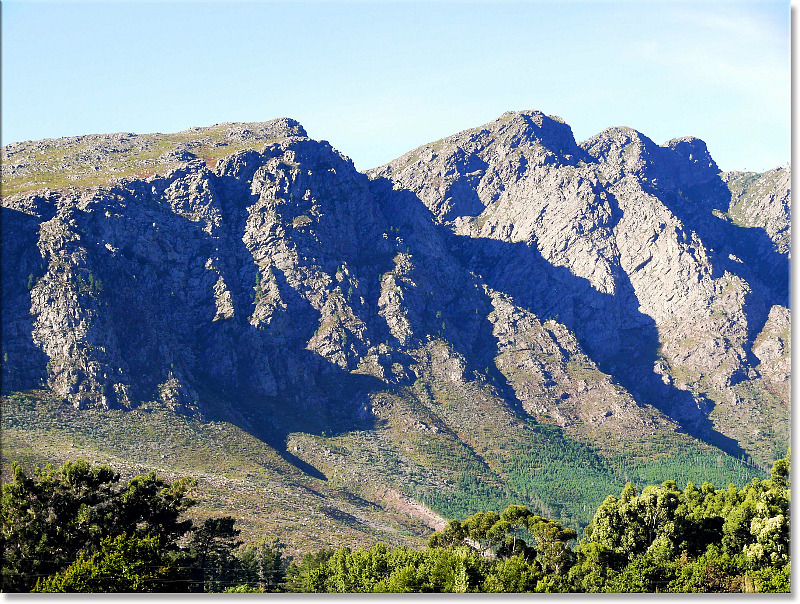 The recommended route for the walk hike up is via Platteklip Gorge to the Upper Cable Station which, at 3 km, is not long but it is fairly strenuous and can take between one and three hours to complete. 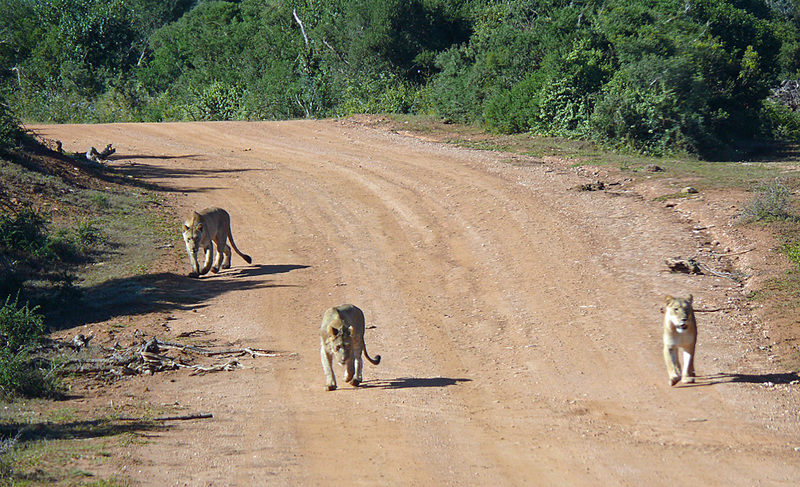 The weather was perfect, the bluest of African skies and not a breath of wind. It seemed as though everyone else had the same idea though and we ended up parking half way down the mountain slope so we were quite breathless before we’d even reached the lower cable station. When stepping out at the top I felt very emotional seeing the wonderful panorama spread beneath my feet. I was home. There simply aren’t words apt enough to describe the stunning vistas. South to Hout Bay and Kommetjie along the spine of the Table range all the way down to Cape Point you can even see the curvature of the earth. 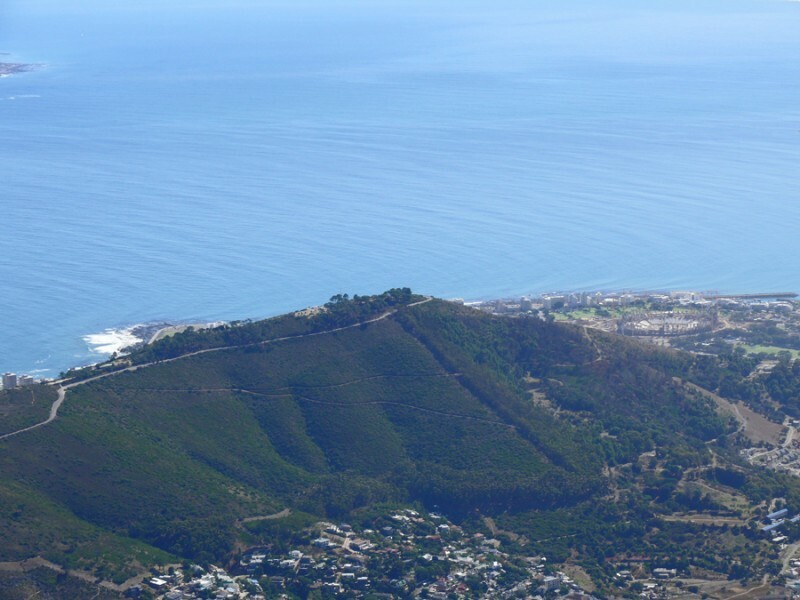 There are three signposted walks and several viewpoints from which you can view Clifton and Sea Point, the Cape Flats and the Cape Peninsula. 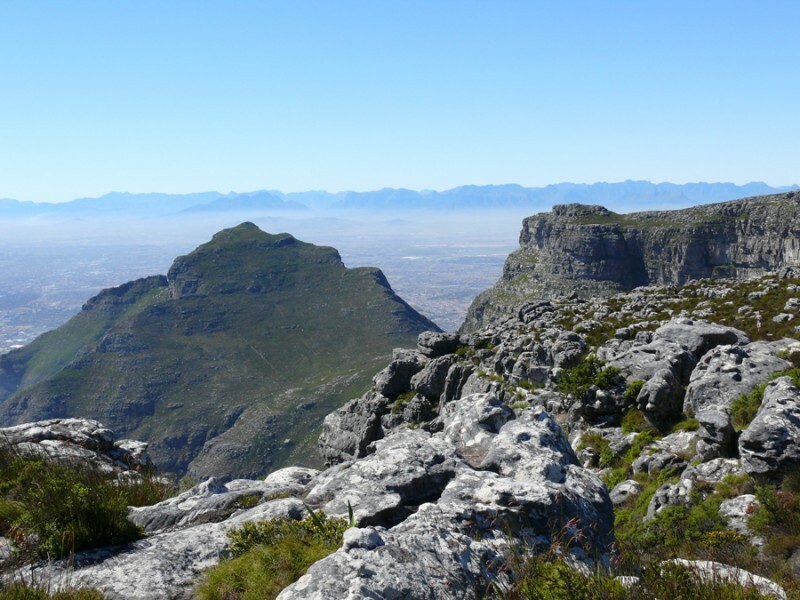 The Table Mountain National Park is also a World Heritage Site. 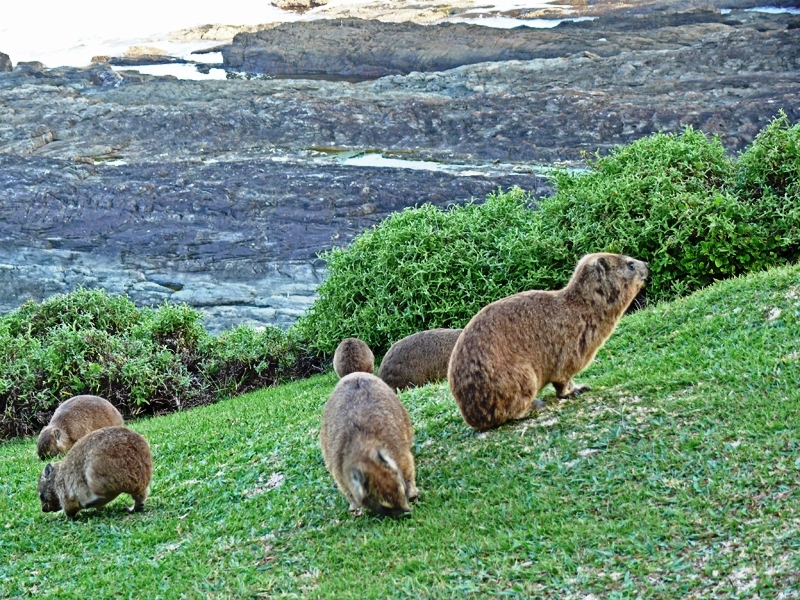 There is a lot of Fynbos vegetation on the mountain, with over 1 460 different species of plants and populations of Rock Hyrax (Procavia capensis), commonly known as Dassies, are plentiful on the mountain. 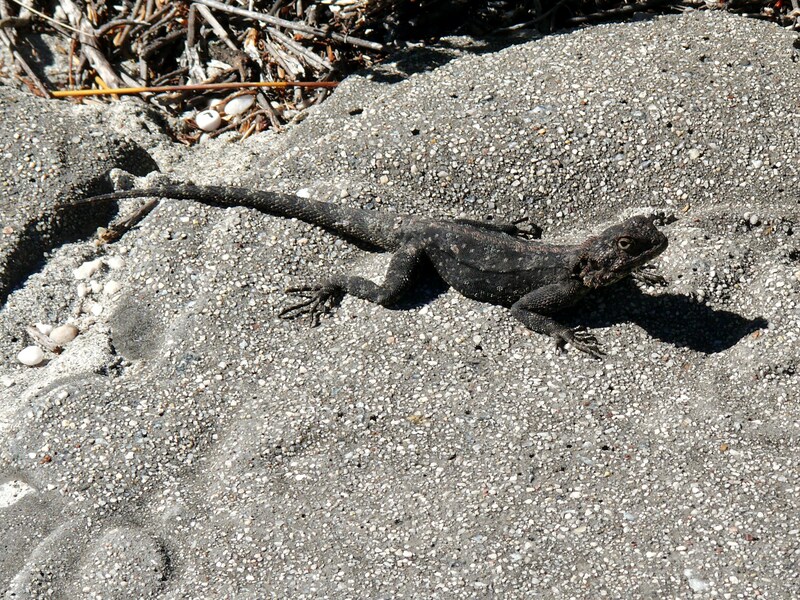 You may also see porcupines, mongooses, girdled lizards, agamas, snakes and butterflies. 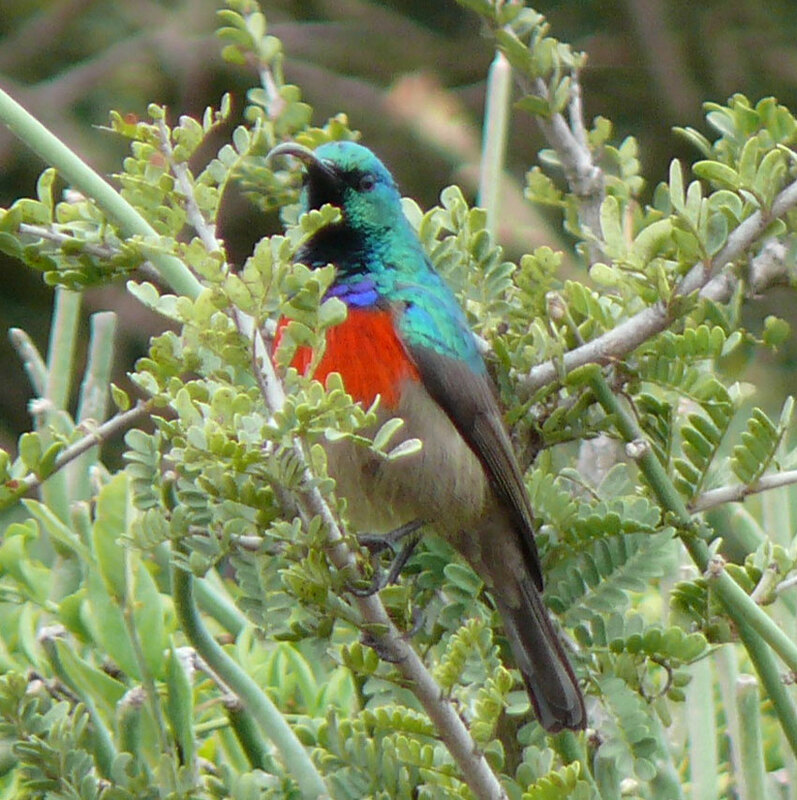 Several indigenous bird species can be seen, including Redwinged Starlings, Cape Verreaux’s Eagles, Rock Kestrels and Sunbirds. A couple of hours later and armed with hundreds of photos we reluctantly went back down and I drove over to the R27, the west coast road, through the western suburbs of Milnerton (a former home) and north towards Tableview, Sunset Beach, Bloubergstrand (blue mountain) and Melkbosstrand (milkwood trees) to take that infamous photo of Table Mountain across Table Bay. I was not surprised at how much this area has changed over the years with so many new housing developments, but so unattractive in my opinion, just dreary looking little boxes and some pretty ugly high-rises. But with exceptional views. This is a place where I spent a lot of time dune walking with my first-born in my arms and usually trying to get out of the wind which whips the sand across your legs with painful accuracy. Not today though. Scarcely a breeze. 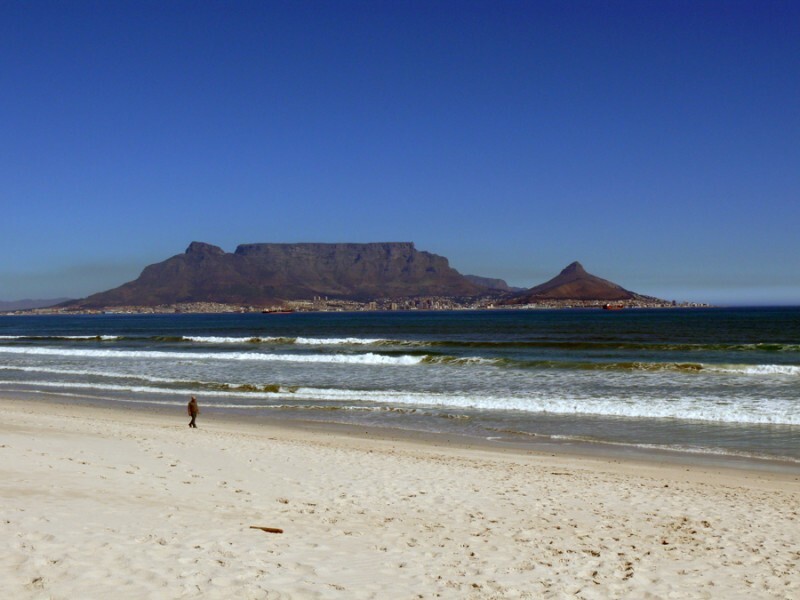 Sitting, hugging my knees on that powder-soft white sand I stared at Cape Town, snuggled at the head of Table Bay, with its incredible back-drop, and remembered the happy days I had spent there. 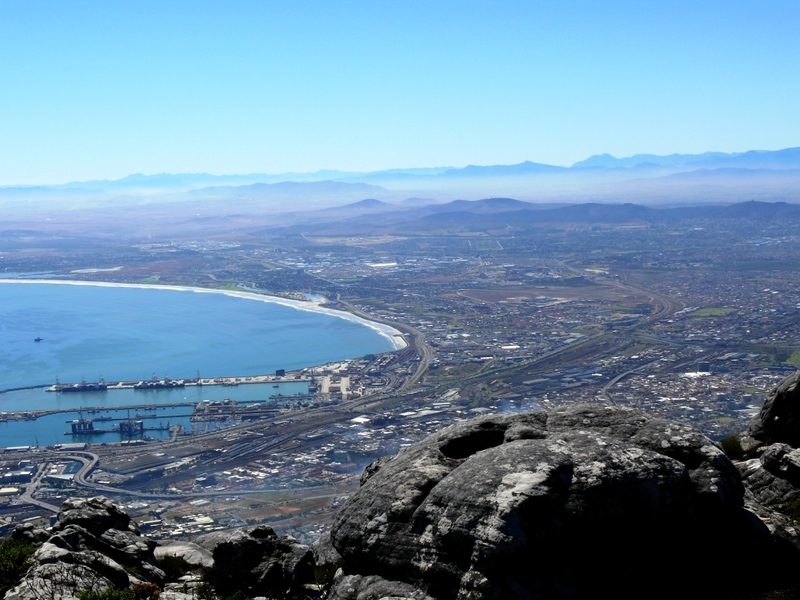 Have you been on top of Table Mountain? Or another mountain which stirs the soul? 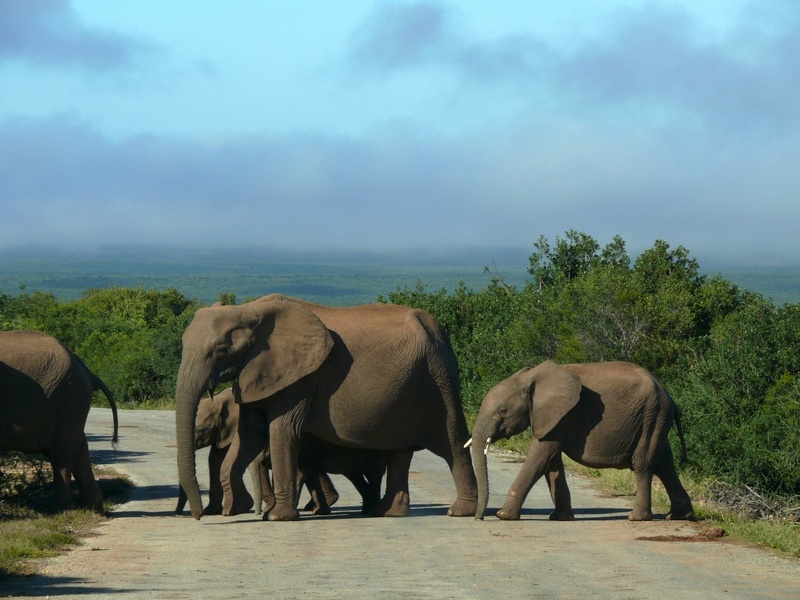 Probably the most famous drive in South Africa, and certainly the Cape, the Garden Route offers beautiful stretches of coastline, lakes, mountains and giant trees. 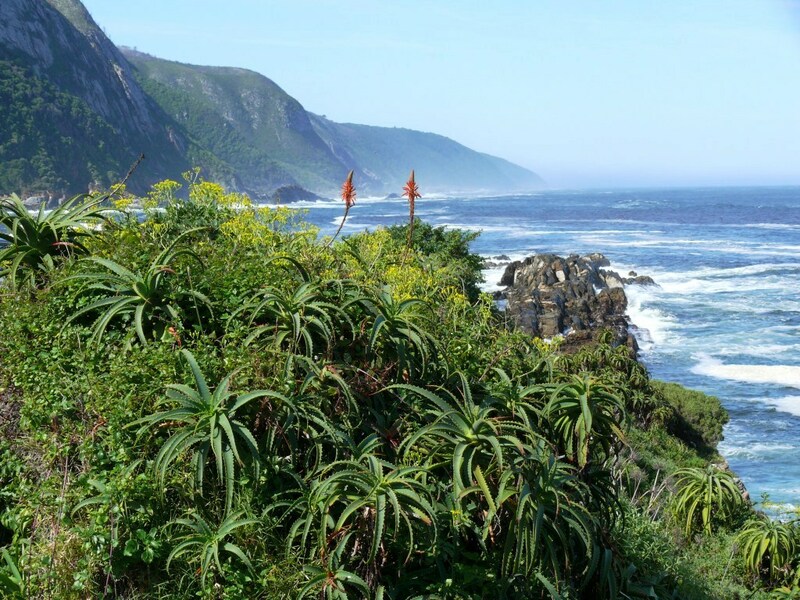 The route is sandwiched between the Outeniqua and Tsitsikamma mountains and the Indian Ocean and although extremely busy in the peak summer season, is a lovely region to visit in the autumn when the weather is still warm enough for outdoors activities, especially hiking. We joined the route at George (see Road Trip: Route 62) and made our way through the traffic to connect with the N2 from Cape Town to Port Elizabeth. 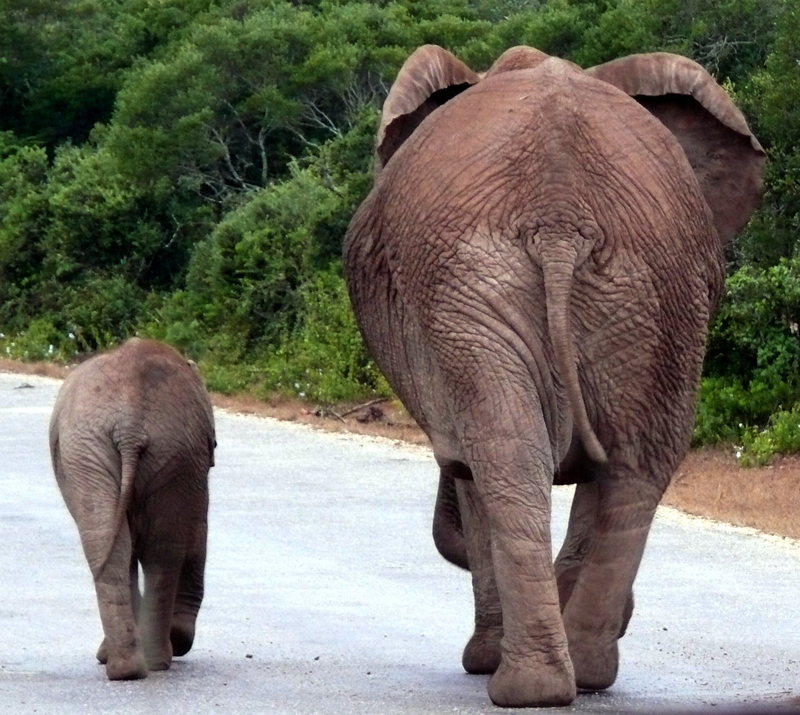 After the tranquillity of the Klein Karoo, it was a bit of a shock to hit commuter traffic once again. 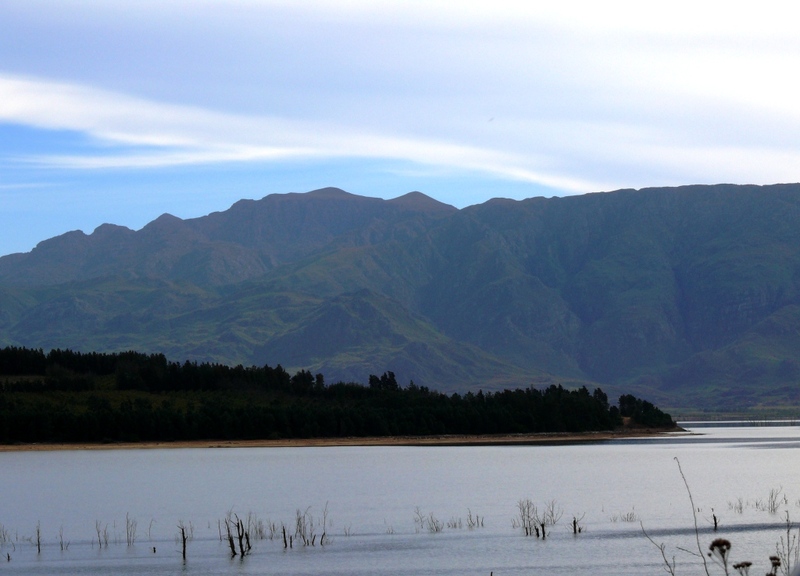 Driving through the Kaaiman’s River Pass along the N2 to Wilderness and seeing the string of lakes I was already regretting my decision not to stay in this lovely area as it looked fantastic and an obvious spot for bird watching. 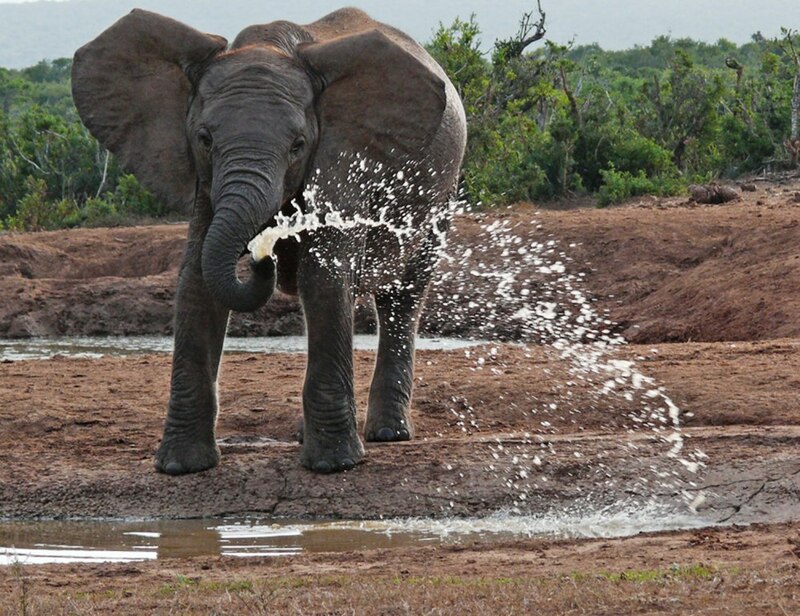 Anyway, another excuse to return to South Africa. Sedgefield is the next village en route and another lovely place among the lakes and sand dunes. This whole area is quite sensational. 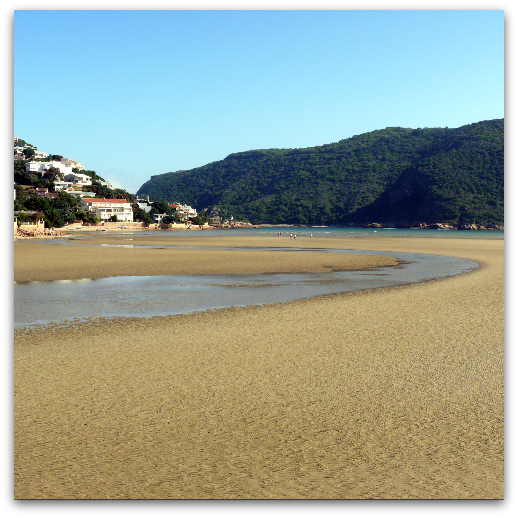 We arrived in Knysna at around 5:30 p.m. staying on the Leisure Isle on the edge of the lagoon with views to the Knysna Heads. OK, so maybe this wasn’t a bad decision after all! 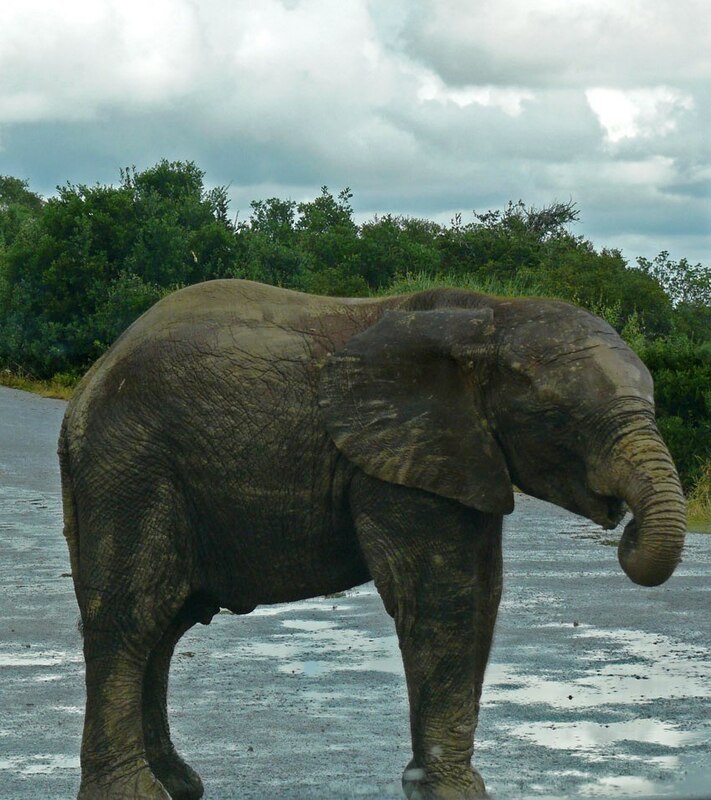 If you have read my previous postings about this trip, (Cape Town Revisited and Route 62), you will have realised that I am no stranger to these parts of South Africa. 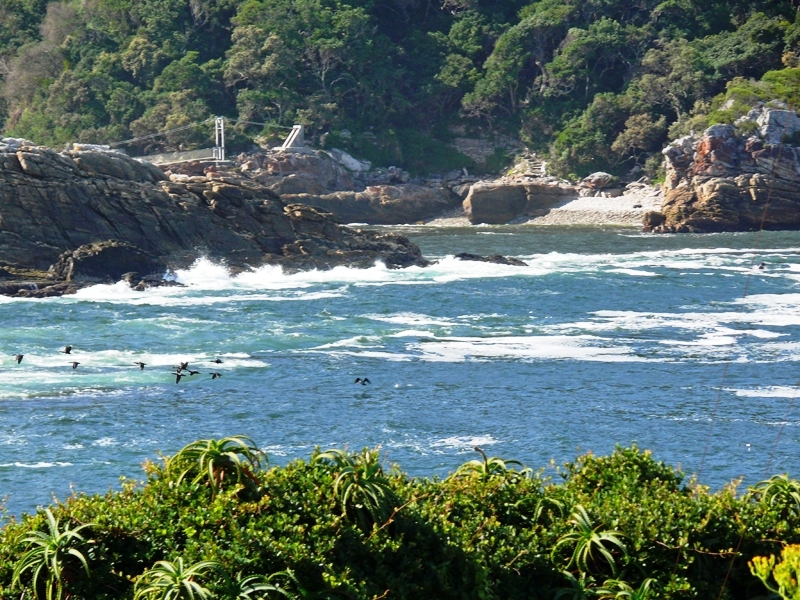 Though saying that, I have also only ever stopped overnight once along the Garden Route and that was in Plettenberg Bay. I travelled along this route many times during the 1970s and 1980s on account of us living on the Western Cape Peninsula and my in-laws in the Eastern Cape. Except for a coffee and a brief stretch of the legs Knysna has always been a town that we passed through, but I have always wanted to see more of this region hence the reason to stop here on this visit. 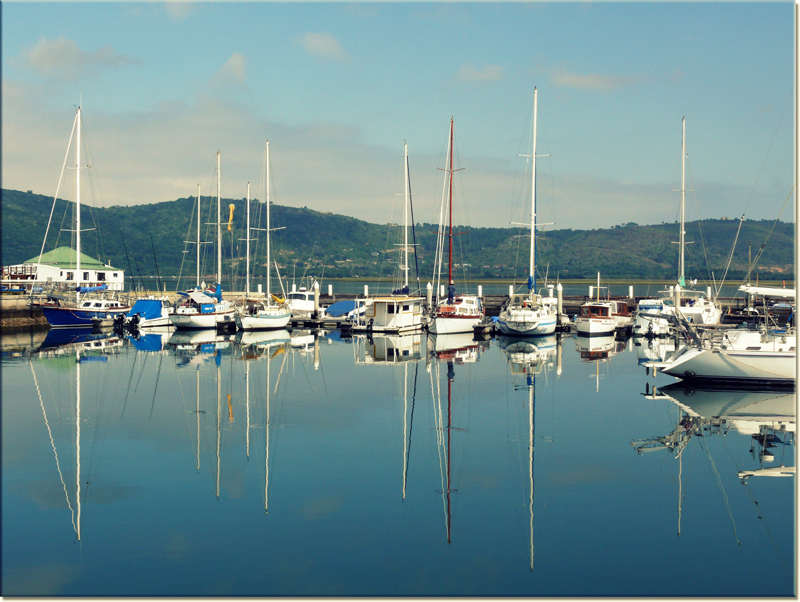 A town that has always attracted artists and hippies as well as bird watchers (Knysna Loerie, Woodpeckers etc) Knysna has been a popular tourist spot and has grown quite a lot since the 1980s with the addition of a new waterfront complex. I was determined on this visit to actually have a chance to look around the town, and I wasn’t disappointed. After settling into our lovely B&B on the edge of the lagoon we walked to the centre of the Leisure Isle to a restaurant called “The Tides” which had an extraordinary chef. Dinner was calamari, prawns and our first Dom Pedro! We were hooked. Forget Irish coffees from now on we wanted Dom Pedros (preferably the Amarula variety), which are basically grown-up milk shakes. Seriously you have to try one. Walking back from the restaurant we were struck by the fact that it was the first time on our holiday that we felt safe out walking at night, (this may have had something to do with the security guard at the entrance onto the island). It is not generally a good idea to walk anywhere in South Africa and especially not at night. The fantastically clear sky with millions of stars above us was stunning. A perfect end to a perfect day. One other thing to add about South Africa is the load shedding, which means that on certain days and at specific times, there is no electricity. I can’t say that it affected us in any major way, but you have to get used to the idea that there may not be electricity when you want a shower, but hey, showering by candlelight is fun! Sometimes you may not get a cooked breakfast, and sometimes you will find traffic cops directing traffic through towns as the robots (traffic lights) aren’t operating, but on the whole it just adds to the fact that you are somewhere different. I am not sure how I’d feel if I was trying to run a business though! 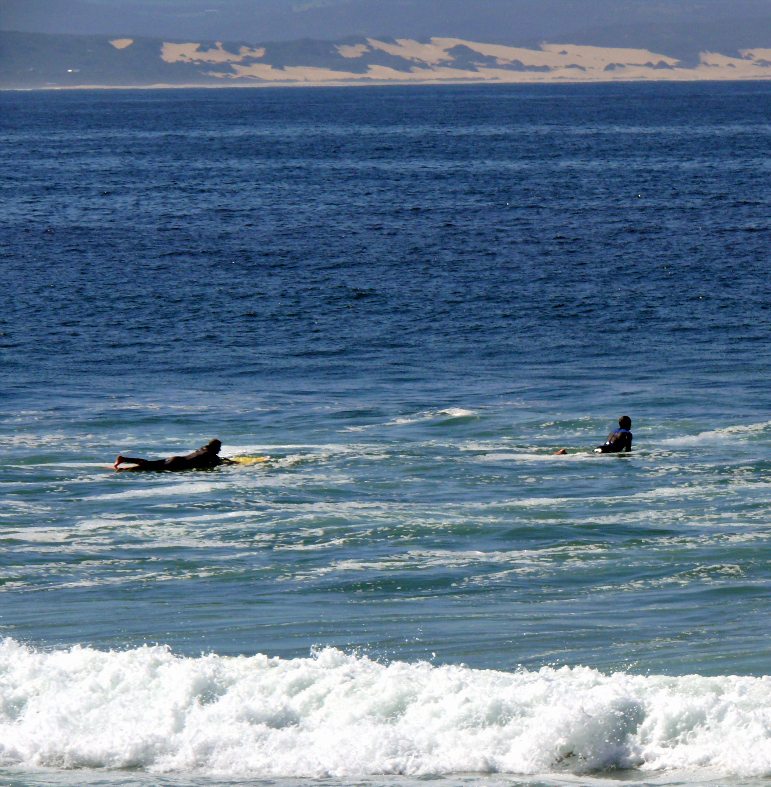 After the effort of driving all day yesterday from Cape Town to Knysna, around 500 km, we decided to take it easy today. It started out fairly cloudy with a little bit of blue sky which disappeared over a perfect breakfast. We first took a stroll around Leisure Isle to walk off the impressive breakfast and also to see if we could spot any birds. 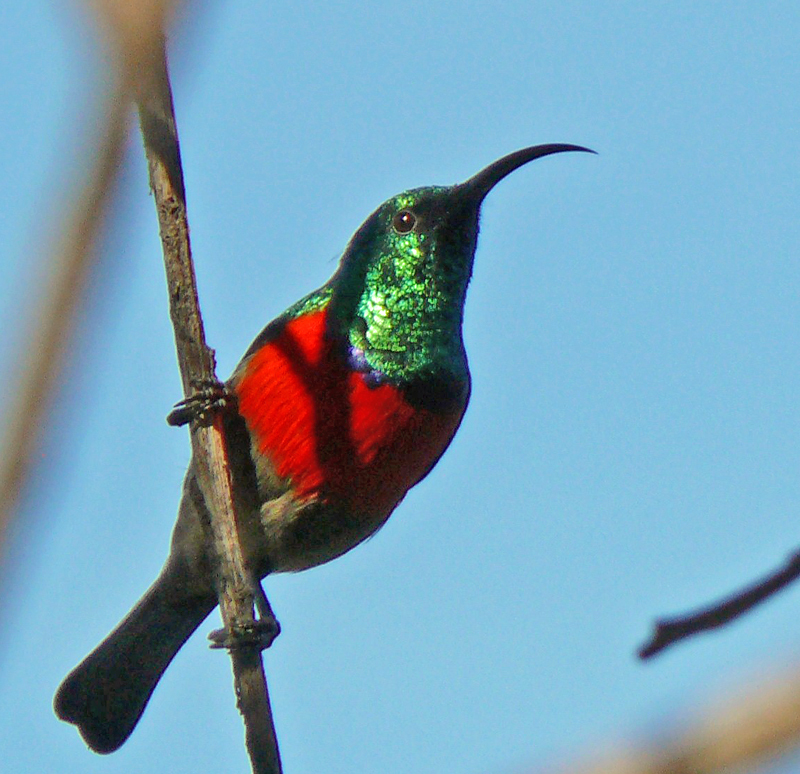 We did manage to snap a couple including this lovely tiny Scarlet-chested sunbird right in the garden where we were staying. We then drove into the town and to the Waterfront. We first went to the station to see if we could get tickets for the Outeniqua Choo Tjooe, the steam train that runs between George and Knysna, but unfortunately all we could tell was that it didn’t appear to have been running for a while as there were no signs of a timetable or any notice saying when the next train would be and no-one in the ticket office. We spotted a meter lady (lots of car parks in South Africa employ parking officers who take a fee for parking as there are no self-service machines) and asked her if she knew what was happening with the train; she told us that it had stopped running because of the flood. Another reason to come back – I have always wanted to do this train journey as the rails cross over the lagoon, pretty spectacular! We went for a stroll around the Waterfront instead, which has the usual souvenir shops and restaurants (but much, much smaller than the one at Cape Town) and by this time the sun had broken through the cloud and it was pretty hot. (We later discovered that it was not running due to heavy flooding which had happened seven months ago!) After taking some photos of the lagoon, a very noisy duck, a heron and the Waterfront, we drove to Brenton-on-Sea, a place I had never heard about, but never visited and I’m not sure I want to share it with you either! It is such a lovely place. To get there you go back along the N2 towards George, but immediately after the White Bridge turn off and go under the N2. 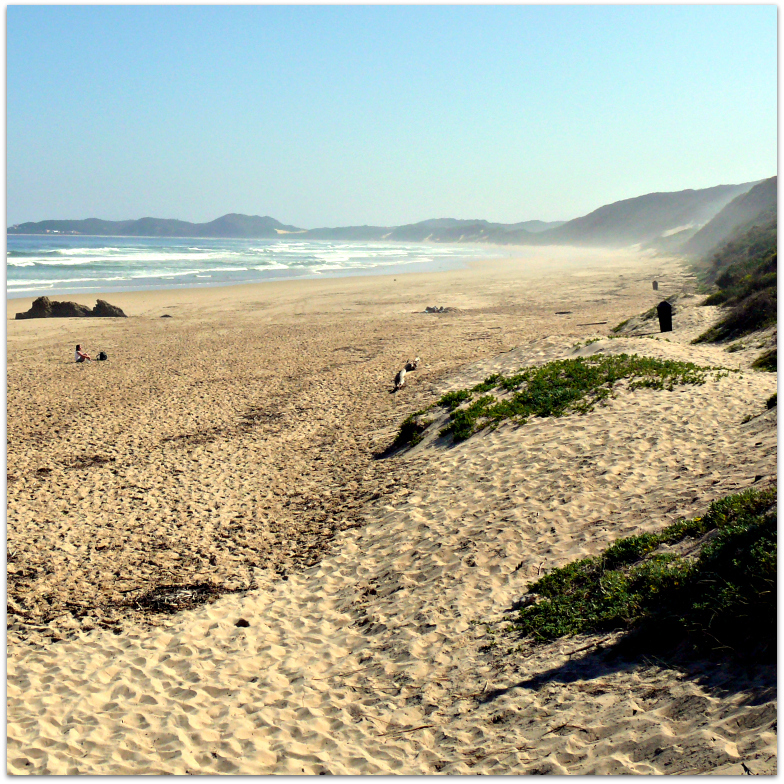 Brenton has such a fantastic sandy beach with rock pools and unusual sandstone rock formations at one end (similar to Kenton-on-Sea, which is a lovely resort between the cities of Port Elizabeth and East London). 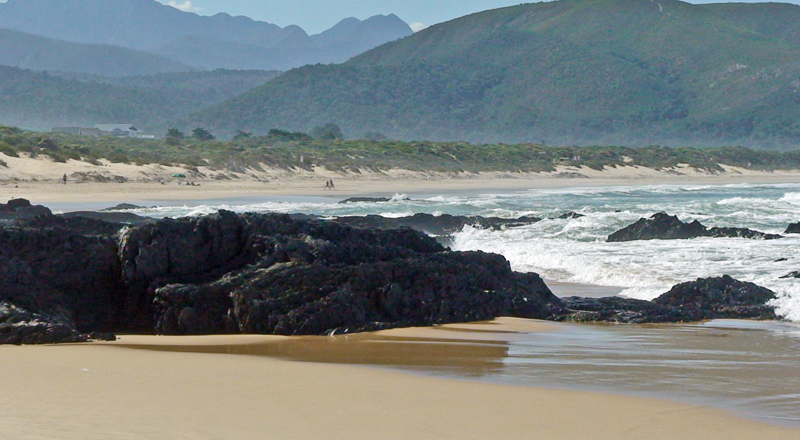 You can walk along this beach to Buffalo Bay – which is a popular spot for surfers; it is around 7km return. 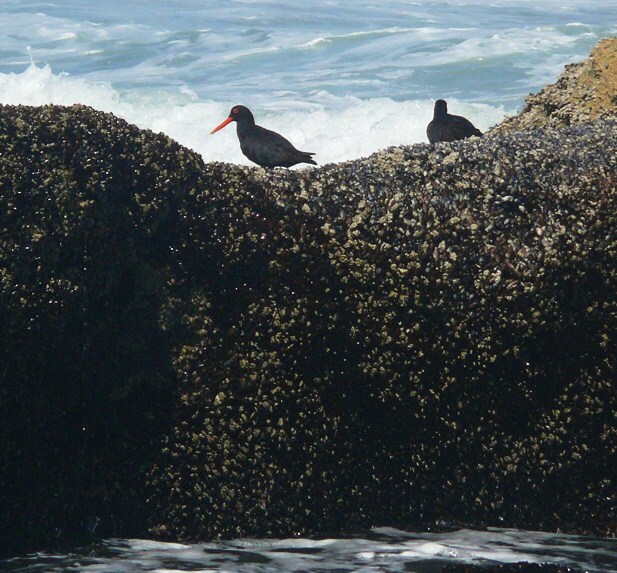 Since we were still feeling tired from yesterday’s driving we decided not to do the walk, but still ended up wandering leisurely along the beach for an hour or so and saw several oyster-catchers on the shoreline. Glimpsed lovely views over the lagoon on the way back to Knysna. 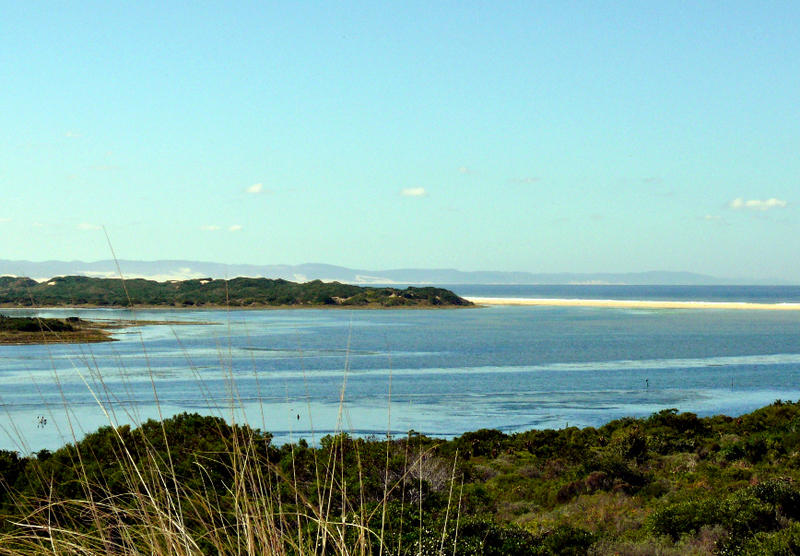 (Food note: On the Brenton road look out for Pembrey, a lovely country restaurant) We returned to the lodge and whilst my husband had a rest, I went wandering in the lagoon which was now a sandy beach as the tide was out. 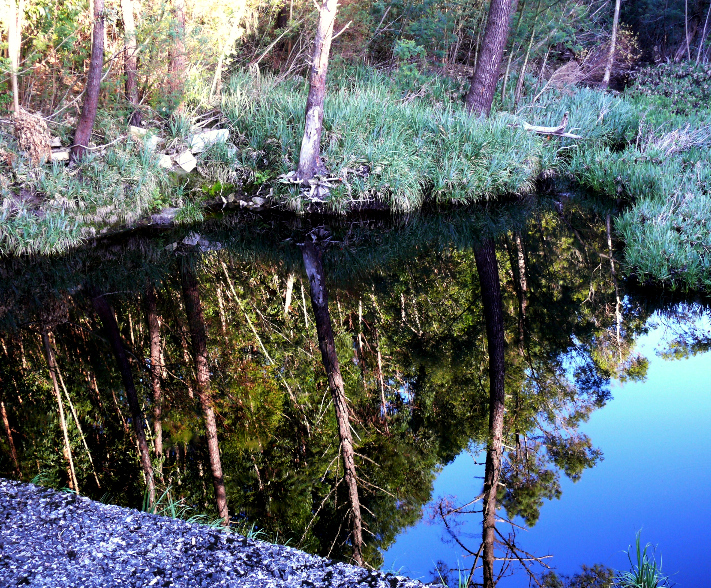 This spot is fantastic for families and young children as it is so safe and the water is shallow and warm. I did get a bit wet when I waded through to the shoreline and hit a shelf: the water went from ankle to thigh deep! 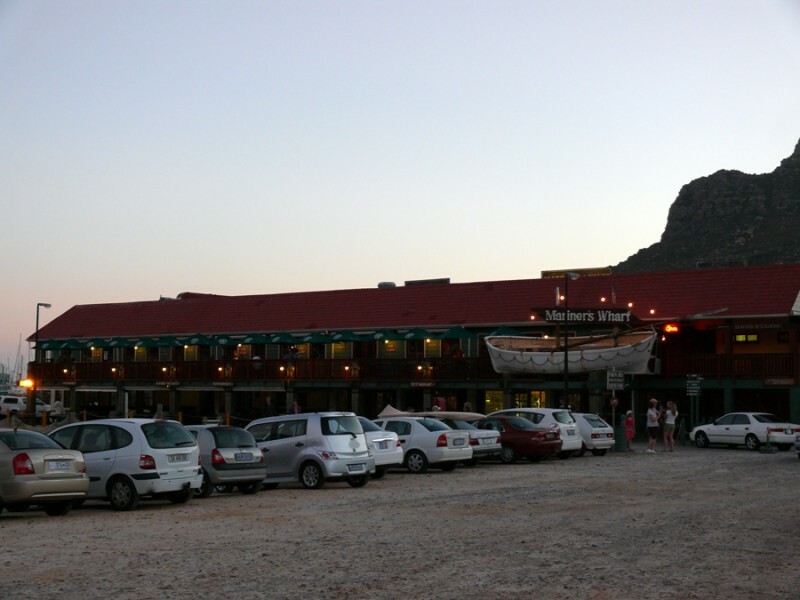 We returned to the Waterfront for dinner at “The Dry Dock“. Food was OK, slightly “Nouvelle cuisine” so small portions, which was fine by us. I had a Wanton Vegetable Melangee to start with followed by Linefish, Aubergine, Avocado and Grapefruit, and my husband had mussels and calamari followed by Linefish with Prawns. 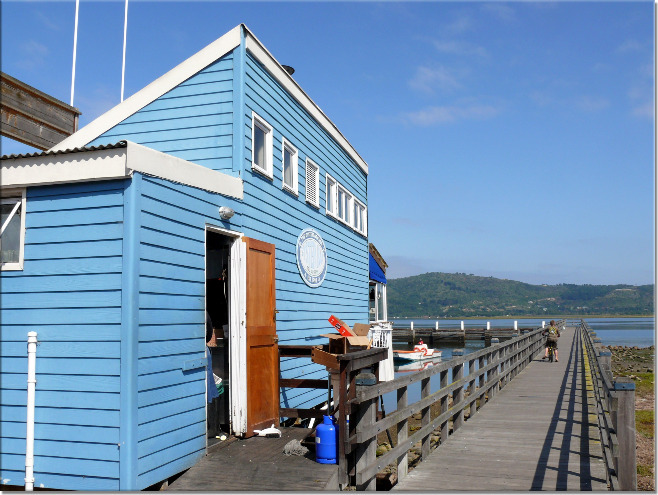 We should really have had oysters as Knysna is famous for them, but unless they are cooked we actually don’t like them. Finished with Dom Pedro Amarula again – I told you, they can become addictive and I don’t even like ice cream! Oh, and did I mention the incredible sunset? 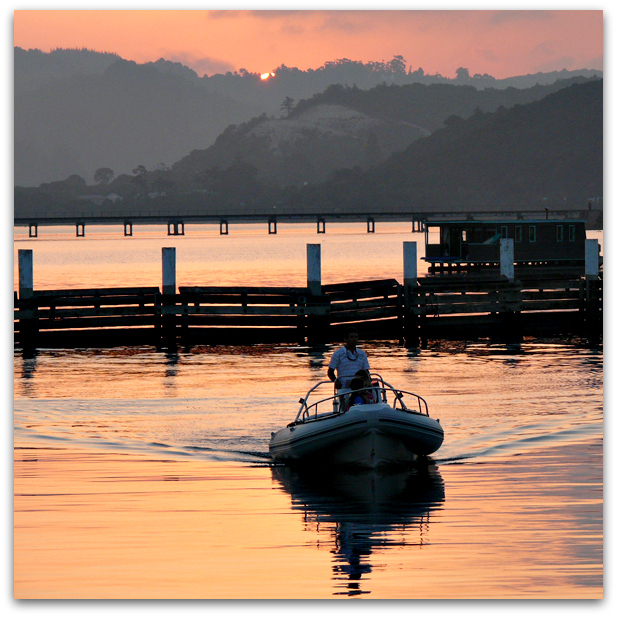 The whole lagoon turned orange – beautiful! I just had to leave my meal to dash to the balcony edge and capture this scene. We finished the day sitting outside our room in the warmth of the evening listening to the sound of cicadas and the gentle lapping of the waves in the lagoon – so peaceful, I could get used to this.